General Comments: It is very dry, no rain again this past week. Scouts are noting signs of moisture stress across fruit, vegetable and agronomic crops. Oriental fruit moth trap captures remained high again this past week in pheromone traps. 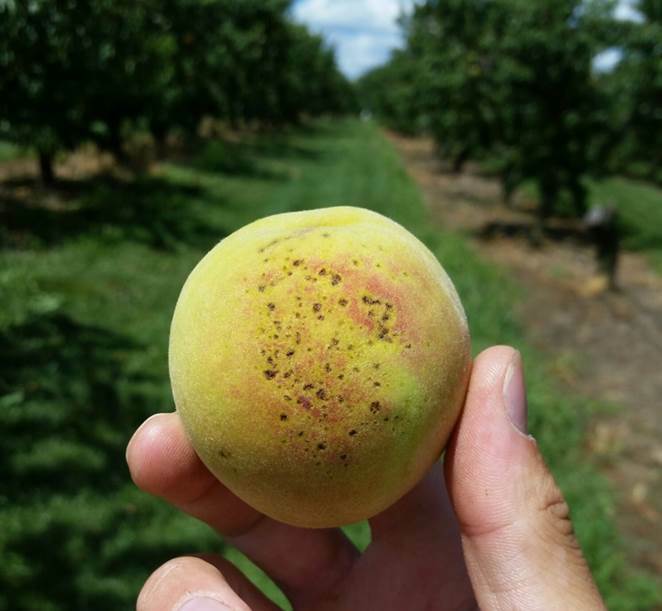 Growers need to be on a regular spray advisory to prevent damage from OFM larvae, but need to watch labels for pre-harvest intervals as many peaches are currently being harvested. Once again this past week we had spotted wing drosophila (SWD) captures from traps in peaches. One trap had more than 20 SWD. bottom of the plants and penetrating into the canopy of the plants. Lack of rainfall is causing a lot of moisture stress, especially in larger fields without irrigation or in any smaller plantings without irrigation. Tomatoes are being harvested. Scouts continue to see septoria leaf spot, and early blight in both field and high tunnel production. Due to the dry weather, blossom end rot is being seen more frequently by scouts in field grown tomatoes. In high tunnel production leaf mold continues on some farms and late blight is showing up in a few high tunnels as well along with powdery mildew. Scouts continued to find tomatoes with stink bug stings in both field and high tunnel production tomatoes. 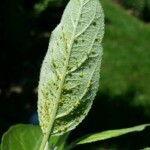 Aphids are being seen in some high tunnels as well. 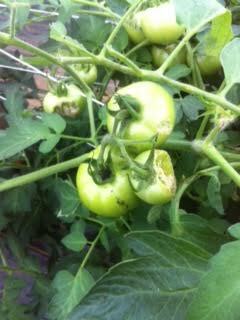 This past week 2-spotted spider mites at treatment threshold levels were found in some high tunnel tomatoes. 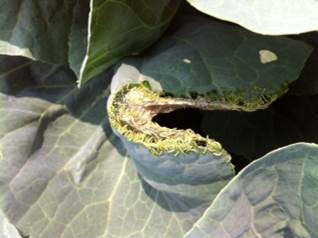 Cole crops planted for fall harvest continue to have pressure from imported cabbage worm with many plantings above treatment threshold levels. Zebra caterpillars were found in several fields this past week. Depending upon the planting date, vine crops range from bloom to harvest. 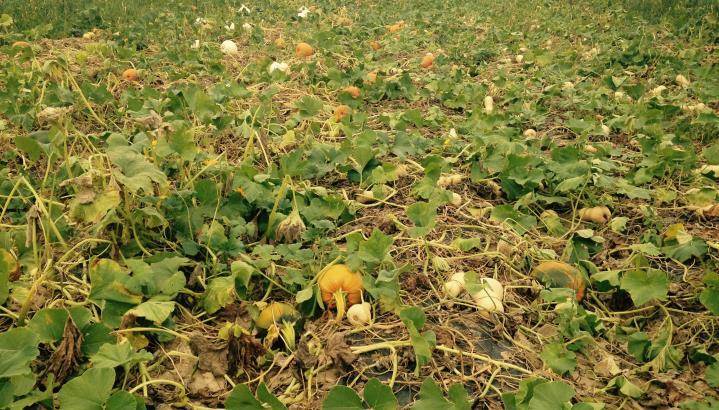 This past week scouts noted wilting leaves and dying leaves in pumpkin and squash fields that are not irrigated. The combination of moisture stress and earlier disease damage, particularly from anthracnose is responsible for this collapse. There are a lot of cucumbers, summer squash, zucchini, and melons (cantaloupe and watermelon) currently being harvested. Powdery mildew is being found by scouts in virtually every planting and growers are being advised on maintaining a fungicide spray program to minimize damage from this disease. 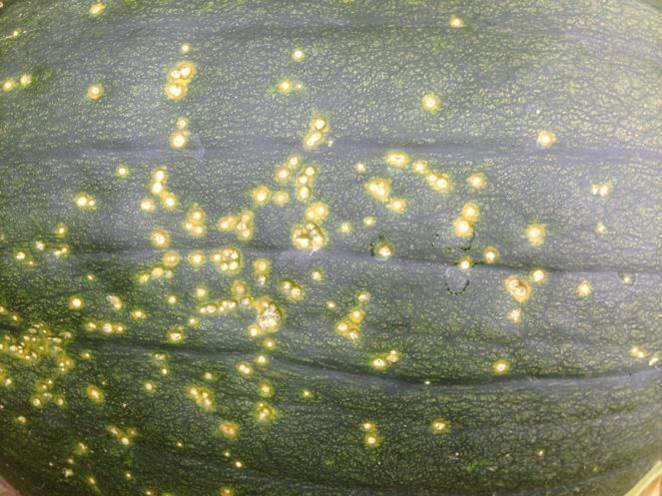 Downy mildew has been found in a number of cucumber plantings and some growers have been able to greatly slow or even arrest the development of the disease with a good fungicide spray program and some help from recent dry and hot weather conditions. Downy mildew has also been found in some plantings of cantaloupe and that disease is now beginning to show up in some squash plantings as well. Anthracnose and angular leaf spot are also commonly noted by scouts in many melon and fall squash and pumpkin plantings. 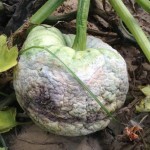 Plectosporium blight has been found in several pumpkin plantings as well and symptoms of the disease are showing up on some of the ripening pumpkin fruit. 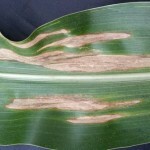 Other diseases that have been noted, but that are not widespread, include phytophthora fruit rot, fusarium fruit rot and septoria leaf and fruit spot. 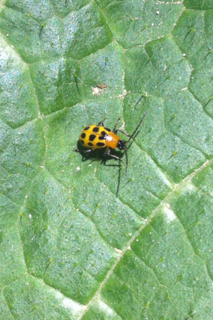 Insect-wise, cucumber beetles continue to be present at anywhere from light to threshold or above numbers and some damage by cucumber beetles chewing on the rinds and stem handles of squash were noted by scouts. Some fields had localized heavy infestation of squash bugs. Eggplant and pepper fruit are being harvested. Scouts noted moisture stress on plants in a number of fields. Sunscald is being noted on both crops by scouts on a frequent basis. Many of those sun scalded fruit are developing secondary botrytis infections. Anthracnose has been found on both leaves and fruit. Alternaria was also noted by scouts in both peppers and eggplant this past week. Some fusarium wilt on eggplant was noted again this week along with some bacterial soft rot in peppers. In some eggplant plantings Colorado potato beetle numbers were at treatment threshold levels. In peppers, some growers are treating for European corn borer (ECB) larvae to prevent damage, and ECB moth numbers in pheromone traps averaged 16/week, so growers do need to be treating to prevent damage. Stink bug stings have been noted on fruit by scouts along withthe presence of aphids.Green snap beans range from in bloom to harvest. Scouts have not noted any disease problems in green beans. Insects that are present include bean leaf beetle, grasshoppers, Japanese beetles and aphids. Sweet corn ranges from plants at V-8 to harvest. Corn earworm trap numbers started to increase this past week. Trap captures ranged from 0 to 8. This may be an indication that the population is starting to increase and growers will need to protect corn at green silk with a shorter interval spray program. European corn borer moth captures ranged from 0 to 2 at 3 locations. Scouts noted some damage to ears from European corn borer larvae and some light flea beetle damage was noted in some plantings by scouts this past week. 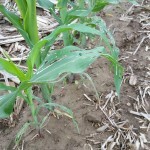 Northern corn leaf blight was noted on the lower leaves of some plantings. Much of the sweet corn, if not irrigated, is showing drought stress. Bird and raccoon damage was noted in some plantings by scouts. Potato harvest is underway in many plantings or plants are drying down so insect and disease monitoring has ended on this crop. Scouting has ended on a lot of field corn as corn enters the R3-R4 stage of development. 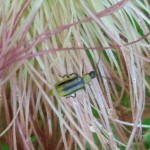 In some later plantings corn rootworm beetles have been noted. Soybeans range from R-5 to R-7. 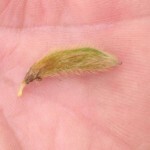 Scouts are noting that soybeans are under moisture stress and some pods are being aborted. 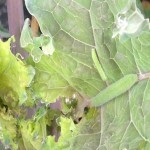 (See picture below of pod) Stink bug numbers are low and grasshopper numbers have declined as well. This week, scouts are noting light to moderate aphid numbers but scouts are also finding ladybird beetles which are a predator of aphids. At this point the ladybird beetles are holding aphid populations in check. This week 2-spotted spider mites were found in low numbers on a couple of fields, probably a reflection of the dry weather being experienced. Alfalfa regrowth following 3rd cut harvest is slow, due to the current dry conditions. Fortunately potato leaf hopper numbers remain very low and are not causing additional stress to alfalfa plants. 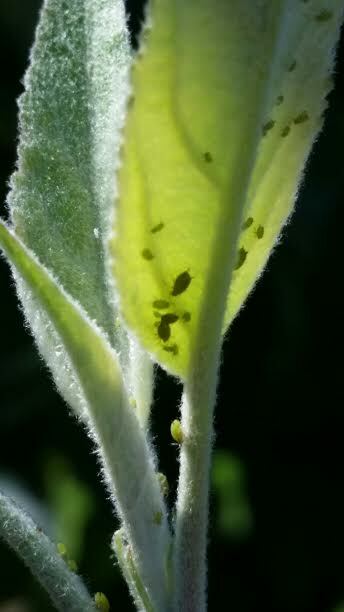 However, aphid numbers are increasing and were approaching or right at threshold levels in a couple of fields. Growers will need to continue to monitor and see if ladybird beetle populations develop that can control the aphid population. General Comments: A common condition affecting fruit, vegetables and agronomic field crops is dryness. The Wayne County area needs rain. This past week despite what looked like a promising forecast for several days of rain, we ended up with only about 0.25 inches. Scouts noted moisture stress symptoms in any crops that were not under irrigation during this past week. Apples are maturing and some are ready for harvest. Once again this past week codling moth trap numbers have remained high in pheromone traps in orchards not using mating disruption. 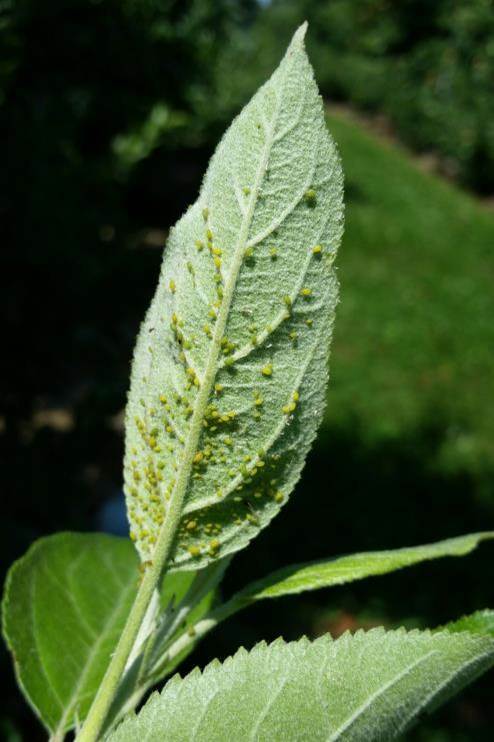 Other insect pests noted on scouting reports include green apple aphids, European red mites, 2-spotted spider mites, and Japanese beetles. As some apple varieties near harvest, growers need to be vigilant about reading labels and watching pre-harvest intervals if they need to treat for codling moths or any other insect pest. Disease-wise, most growers have done an excellent job of keeping up and maintaining fungicide spray programs and scouts are noting very little disease. 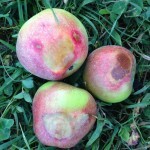 There have been a few apples with some fly speck and some apples with white rot symptoms. Oriental fruit moth trap captures remained high again this past week in pheromone traps. 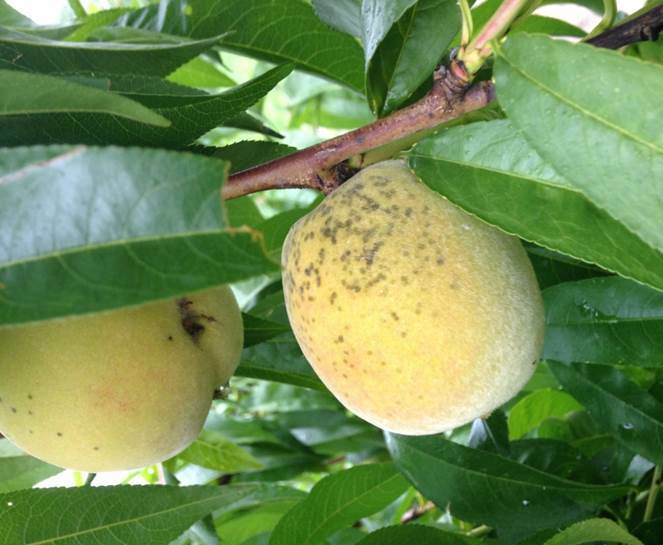 Growers need to be on a regular spray advisory to prevent damage from OFM larvae, but need to watch labels for pre-harvest intervals as many peaches are currently being harvested. In addition, spotted wing drosophila (SWD) traps placed in some peach orchards did capture some SWD this past week. In small fruit, spotted wing drosophila (SWD) trap capture numbers have been increasing in control traps placed near wild fruit that is not being treated with insecticides. These traps have captured close to 100 SWD this past week. Where growers are spraying on a consistent basis, fruit is protected and generally trap numbers are 0 or possibly with 1 or 2 SWD captured. Some raspberry and grape traps recorded 70 or more SWD this past week and growers are being advised to get on and maintain a consistent spray program. Lack of rainfall is becoming an issue, especially in larger fields without irrigation or in any smaller plantings without irrigation and scouts noted moisture stress symptoms in some plantings. Tomatoes are being harvested. Scouts continue to see septoria leaf spot, and early blight in both field and high tunnel production. (See photo below) On the positive side, our current dry weather is slowing the spread of these diseases and later plantings look much better than early plantings. 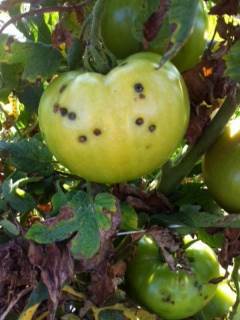 Many field grown tomatoes also have bacterial diseases and scouts continue to note yellow shoulder. In high tunnel production leaf mold continues on some farms and late blight is showing up in a few high tunnels as well along with powdery mildew. Scouts continued to find tomatoes with stink bug stings in both field and high tunnel production tomatoes. 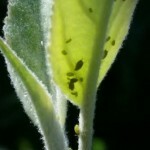 Aphids are being seen in some high tunnels as well. Cole crops planted for fall harvest continue to have pressure from imported cabbage worm with many plantings above treatment threshold levels. Some plantings also had flea beetles at treatment threshold levels. An outbreak of zebra caterpillars in one field was causing some localized heavy feeding damage. Depending upon the planting date, vine crops range from bloom to harvest. There is a lot of cucumbers, summer squash, zucchini, and melons (cantaloupe and watermelon) currently being harvested. Powdery mildew is being found by scouts in virtually every planting and growers are being advised on maintaining a fungicide spray program to minimize damage from this disease. 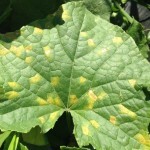 Downy mildew has been found in a number of cucumber plantings and some growers have been able to greatly slow or even arrest the development of the disease with a good fungicide spray program and some help from recent dry and hot weather conditions. Downy mildew has also been found in some plantings of cantaloupe and that disease is now beginning to show up in some squash plantings as well. Anthracnose and angular leaf spot are also commonly noted by scouts in many melon and fall squash and pumpkin plantings. 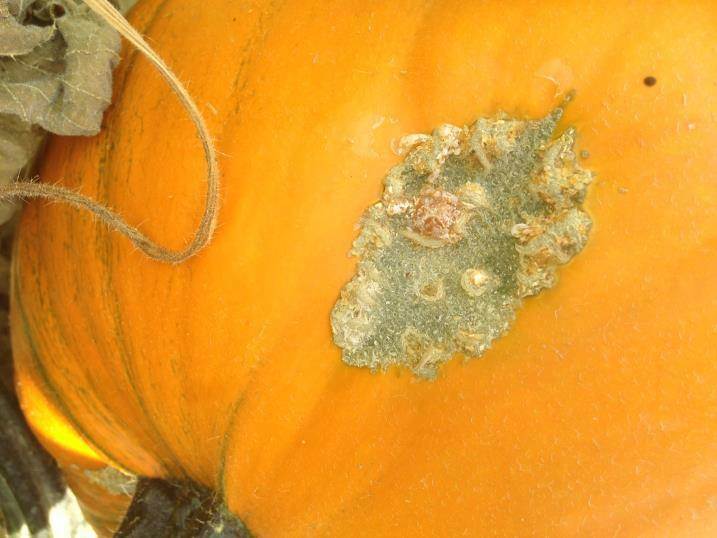 Plectosporium blight has been found in several pumpkin plantings as well and symptoms of the disease are showing up on some of the ripening pumpkin fruit. (See photo below) Other diseases that have been noted, but that are not widespread, include phytophthora fruit rot, fusarium fruit rot and septoria leaf and fruit spot. 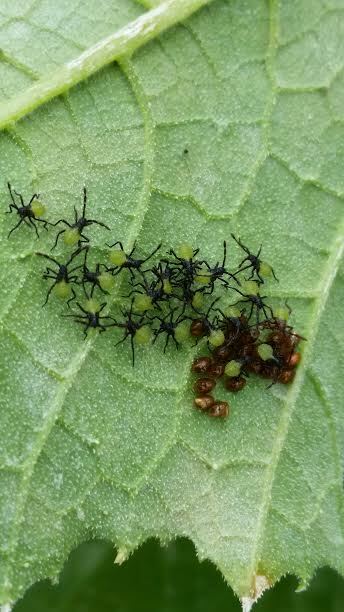 (See photo below) Insect-wise, cucumber beetles continue to be present at anywhere from light to threshold or above numbers and some damage by cucumber beetles chewing on the rinds and stem handles of squash were noted by scouts. 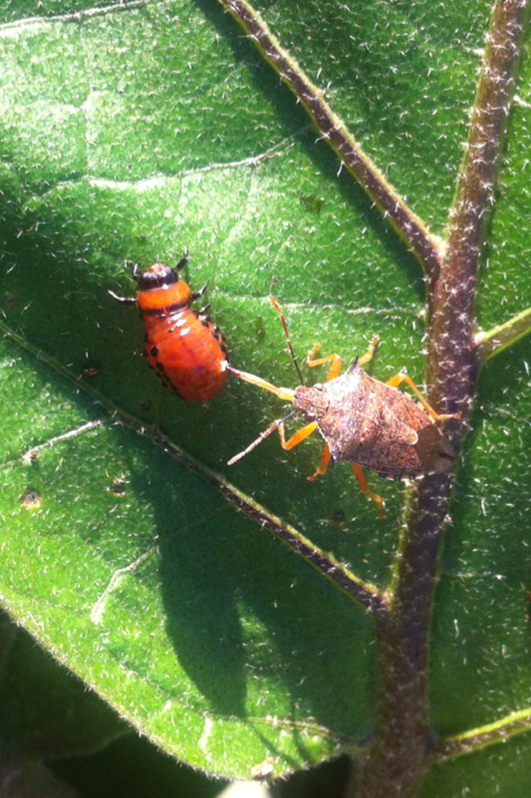 Some fields had localized heavy infestation of squash bugs. Eggplant and pepper fruit are being harvested. Sunscald is being noted on both crops by scouts on a frequent basis. Many of those sun scalded fruit are developing secondary botrytis infections. Anthracnose has been found on both leaves and fruit. Alternaria was also noted by scouts in both peppers and eggplant this past week. Some fusarium wilt on eggplant was noted this week along with some bacterial soft rot in peppers. In some eggplant plantings Colorado potato beetle numbers were at treatment threshold levels. In peppers, some growers are treating for European corn borer (ECB) larvae to prevent damage, and ECB moth numbers in pheromone traps averaged 9/week, so growers do need to be treating to prevent damage. Stink bug stings have been noted on fruit by scouts along with the presence of aphids and grasshoppers. Green snap beans range from in bloom to harvest. Scouts have not noted any disease problems in green beans. This past week the greatest damage was coming as a result of ground hogs and deer feeding on the crop. Sweet corn ranges from plants at V-7 to harvest. Corn earworm trap numbers remain very low, 0 in traps at 4 locations this past week. European corn borer moth captures ranged from 0 to 7 at 4 locations. Scouts noted some damage to ears from European corn borer larvae and damage to sweet corn plants from fall armyworm as well as some silk clipping due to Japanese beetle feeding. 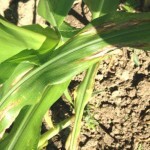 Rust and Northern corn leaf blight were noted on the lower leaves of some plantings. Much of the sweet corn, if not irrigated, is showing drought stress. Scouting has ended on a lot of field corn as corn enters the R3-R4 stage of development. 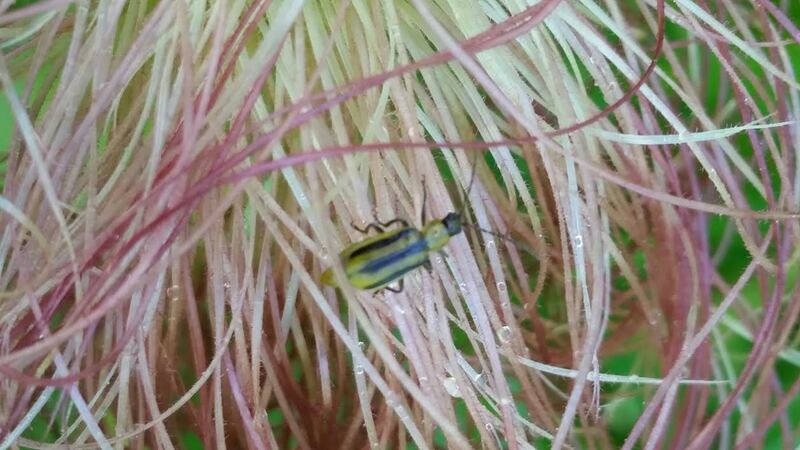 In some later plantings corn rootworm beetles and some Japanese beetles have been noted. Alfalfa regrowth following 3rd cut harvest is slow, due to the current dry conditions. Fortunately potato leaf hopper numbers remain very low and are not causing additional stress to alfalfa plants. Other insects being noted by scouts in alfalfa include grasshoppers, aphids, plant bugs and loopers. Apples are maturing. Codling moth trap numbers have remained high in some orchards and other insect pests noted on scouting reports include green apple aphids, European red mites, 2-spotted spider mites, and Japanese beetles. As some apple varieties near harvest, growers need to be vigilant about reading labels and watching pre-harvest intervals if they need to treat for codling moths or any other insect pest. Disease-wise, most growers have done an excellent job of keeping up and maintaining fungicide spray programs and scouts are noting very little disease. 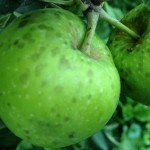 There have been a few apples with some fly speck and some apples with white rot symptoms. Really the only issue with peaches is that oriental fruit moth (OFM) trap captures have remained high for the past 2 months so growers have been on a regular spray advisory to prevent damage from OFM larvae. In small fruit, spotted wing drosophila (SWD) trap capture numbers have been increasing in control traps placed near wild fruit that is not being treated with insecticides. These traps have captured between 20 to 40 + in this past week. Where growers are spraying on a consistent basis, fruit is protected and generally trap numbers are 0 or possibly with 1 or 2 SWD captured. Lack of rainfall is becoming an issue, especially in larger fields without irrigation or in any smaller plantings without irrigation. Tomatoes are being harvested and given the disease pressure that many plantings had to contend with quality is good. Scouts continue to see septoria leaf spot, and early blight in both field and high tunnel production. The recent dry weather spell is slowing the spread of these diseases and later plantings look much better than early plantings. Many field grown tomatoes also have bacterial diseases and scouts continue to note yellow shoulder. 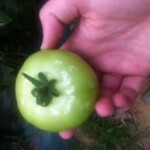 Also in open field tomatoes scouts are seeing tomato sun scald on fruit from to much exposure to sun light. (See photo below) In high tunnel production leaf mold continues on some farms and late blight is showing up in a few high tunnels as well along with powdery mildew. Tomato hornworms appear to have run their course but scouts are finding tomatoes with stink bug stings in both field and high tunnel production tomatoes. 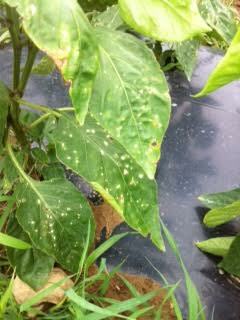 Aphids are being seen in some high tunnels as well. Cole crops planted for fall harvest continue to have pressure from imported cabbage worm, with some fields at or above treatment threshold levels. (See picture below) Japanese beetles and grasshoppers were also noted on some scouting reports as causing some light damage to cole crop plants. Depending upon the planting date, vine crops range from bloom to harvest. There is a lot of cucumbers, summer squash, zucchini, and melons (cantaloupe and watermelon) currently being harvested. 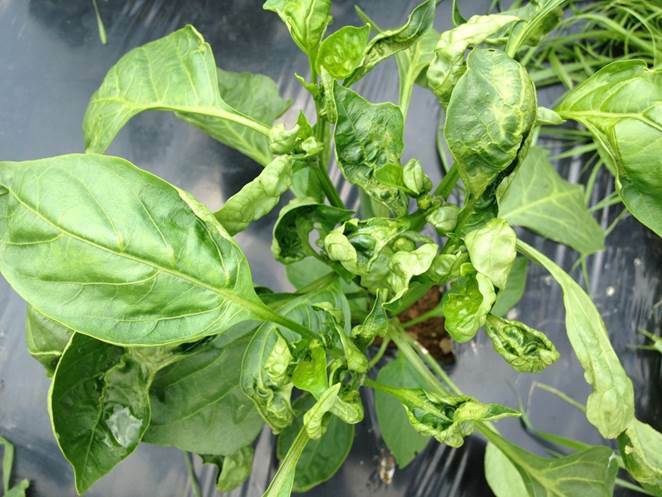 Powdery mildew is being found by scouts in virtually every planting and growers are being advised on maintaining a fungicide spray program to minimize damage from this disease. Downy mildew has been found in a number of cucumber plantings and some growers have been able to greatly slow or even arrest the development of the disease with a good fungicide spray program and some help from recent dry and hot weather conditions. Downy mildew has also been found in some plantings of cantaloupe. Anthracnose and angular leaf spot are also commonly noted by scouts in many melon and fall squash and pumpkin plantings. 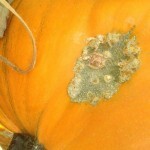 Plectosporium blight has been found in several pumpkin plantings as well. 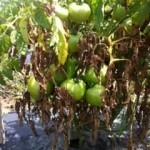 Other diseases that have been noted, but that are not widespread, include phytophthora fruit rot, fusarium fruit rot and septoria leaf and fruit spot. Insect-wise, cucumber beetles continue to be present at anywhere from light to threshold or above numbers, and squash bugs and grasshoppers have also been noted in scout reports. Eggplant and pepper fruit are being harvested. Sunscald is being noted on both crops by scouts on a frequent basis. Anthracnose has been found on both leaves and fruit. (See photo below) Some fusarium wilt on eggplant was noted this week along with some bacterial soft rot in peppers. 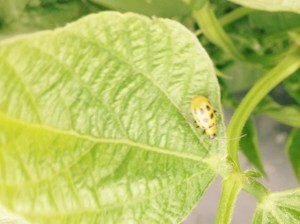 In some eggplant plantings Colorado potato beetle numbers were very heavy, triggering a recommendation to treat. Scouts also noted some flea beetles on eggplants. 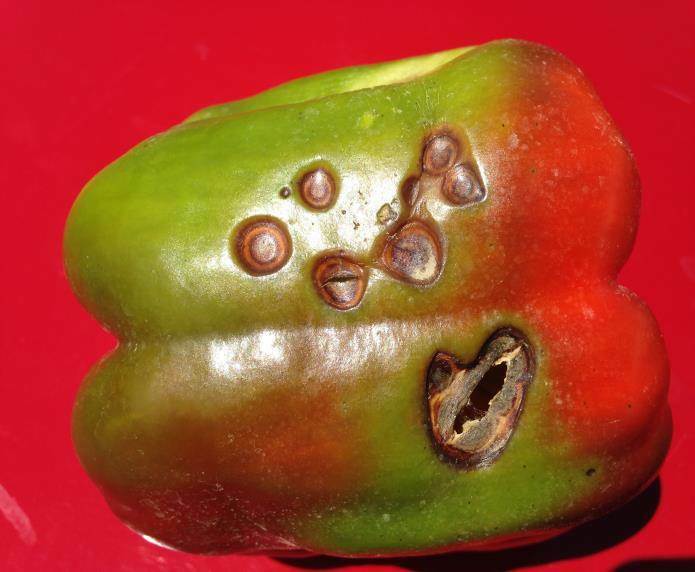 In peppers, some growers are treating for European corn borer larvae to prevent damage. Stink bug stings have been noted on fruit by scouts along with the presence of aphids and grasshoppers. Green snap beans range from in bloom to harvest. 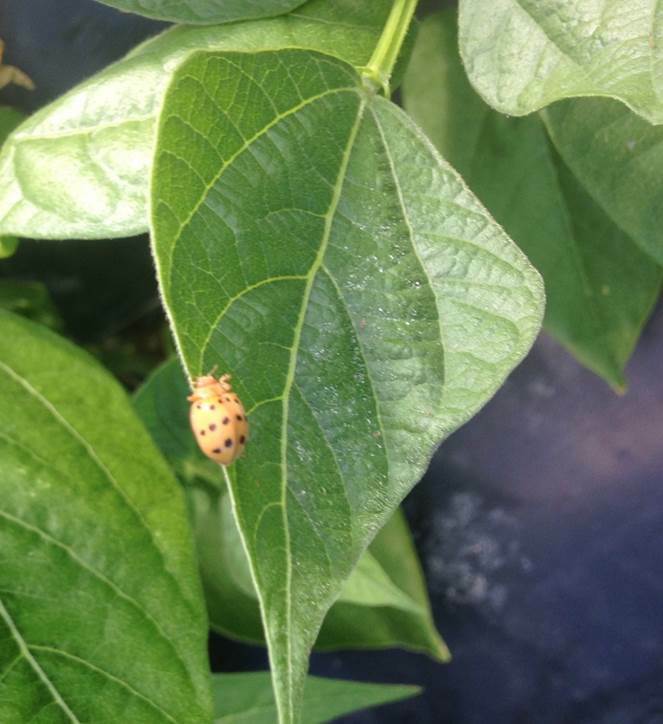 Scouts have not noted any disease problems in green beans, but a number of insect pests are present including bean leaf beetles, potato leaf hoppers, grasshoppers and Japanese beetles, although nothing at an economic treatment level. Sweet corn ranges from plants at V-6 to harvest. Corn earworm trap numbers remain very low, 0 in traps at 4 locations this past week. European corn borer moth captures ranged from 0 to 8 at 4 locations. 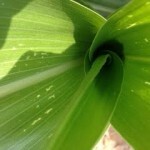 Currently there is low disease and insect pressure in sweet corn. Soybeans range from R-2 to R-6. This week, scouts started to find some aphids, although at very low numbers, but this will bear watching for later maturing fields. Stink bugs continue to also be at very low numbers, averaging less than 1 per 10 sweep sample. In some fields scouts are noting between 10-20% defoliation attributed to a combination of Japanese beetle and grasshopper feeding damage. Scouts are also finding some very small amounts of sudden death syndrome and white mold in some fields. Alfalfa regrowth following 3rd cut harvest is slow, due to the current dry conditions. Fortunately potato leaf hopper numbers remain very low and are not causing additional stress to alfalfa plants. Other insects being noted by scouts in alfalfa include grasshoppers, aphids and loopers. Apples are ripening with some varieties at maturity. Codling moth trap numbers remained high in several orchards this week, so growers will need to continue with follow up insecticide applications. 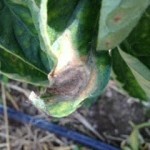 White rot, another of our summer diseases was found by scouts on some apples in one orchard this week. (See photo below) Growers need to stay on a consistent fungicide spray program with intervals no longer than 14 days between applications to prevent both sooty blotch, fly speck and summer apple rot disease development. All apple maggot traps remained negative the week of August 3-7. Green apple aphid populations were at high levels, above treatment thresholds, in some orchards again this week. Other insects noted at below threshold levels in orchards included European red mites and 2-spotted spider mites. Spotted wing drosophila (SWD) continue to be caught in traps. In our IPM program we have traps in fruit that are being sprayed on a regular spray schedule to protect against SWD damage and we have traps in wild fruit populations that are not sprayed. Numbers in those wild traps are consistently higher than traps in sprayed fruit. 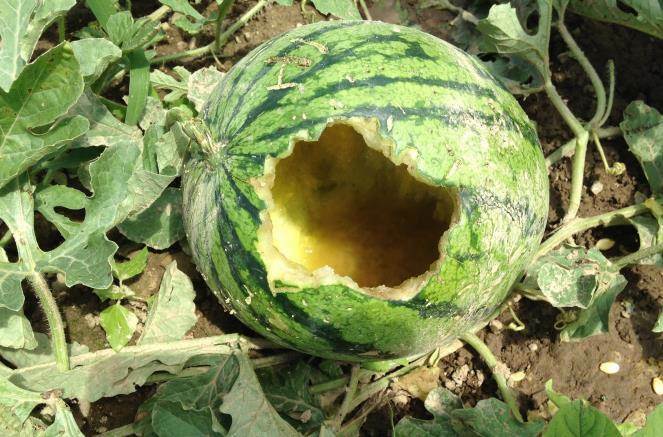 Most often traps in sprayed fruit are at 0. 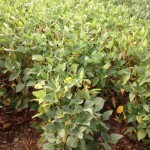 Spray programs can be effective in controlling SWD damage. Commercial small fruit growers should be spraying ripe fruit and fruit that are beginning to ripen to protect against SWD infestation. Rotate between chemical classes of approved insecticides. No measurable precipitation this week. There were a few comments by scouts on their grower reports that plants needed water or were showing symptoms of moisture stress. The most serious disease problems in both field and high tunnel grown tomatoes remain septoria leaf spot and early blight. Some early plantings have been finished off by the advances of these diseases. 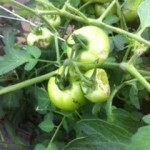 This week late blight was found in some high tunnel cherry tomatoes. 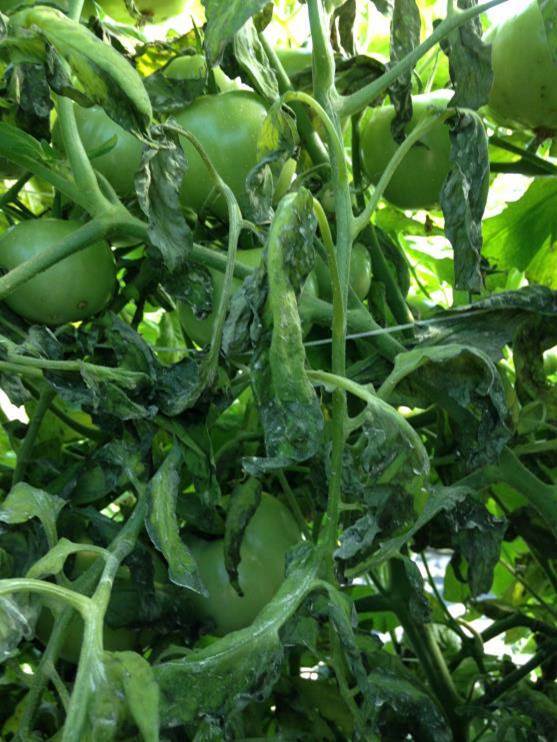 Bacterial spot and canker can be found in field tomatoes and growers are being advised to not work with the plants when they are wet, practice good sanitation between infected and non-infected plants and maintain a copper spray program to suppress the disease. In high tunnel production scouts are finding fusarium crown rot, Fusarium wilt, leaf mold, botrytis gray mold, timber rot and powdery mildew. Due to the fluctuations in soil moisture as we have gone from very wet soils to dry soils, blossom end rot is showing up on tomato fruit. This is not a disease but is related to a shortage of calcium in the fruit, most often triggered by moisture fluctuations. Other non-disease, environmental disorders that scouts are finding in both field and high tunnel production include yellow shoulder, catfacing and zippering. 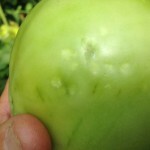 Stink bug damage is being found on tomatoes and hornworms have been found in both high tunnel and field grown tomatoes. Scouts noted some moderate to high aphid numbers in a couple of tomato high tunnels again this week. 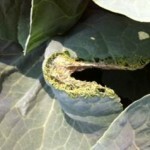 Many of the cole crop fall harvest plantings had imported cabbage worm numbers above treatment threshold this week and growers were advised to treat. Flea beetles were also above threshold levels on several of these plantings. In vine crops, many plantings of summer squash and zucchini are being harvested regularly, fall squash and pumpkins are in bloom to some approaching harvest, cantaloupes are being harvested, watermelons range from fruit set to harvest, and cucumbers range from new plantings to harvest. 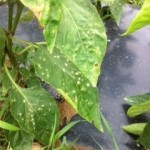 Downy mildew continues to advance and is being found by scouts on more cucumbers. Scouts also found more possible downy mildew in cantaloupe and squash. Samples have been delivered to the vegetable pathology lab at OARDC for confirmation. Growers are being advised to use a fungicide spray program on a 5-7 day schedule to protect against downy mildew. 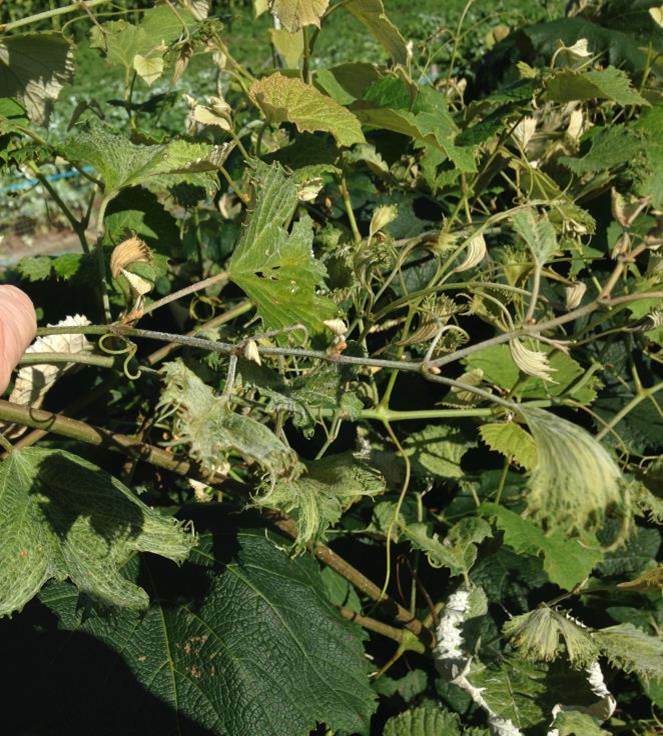 Powdery mildew is developing quickly on all vine crops and scouts were advising growers to get on and maintain a regular fungicide program to protect leaves and to protect developing fruit. 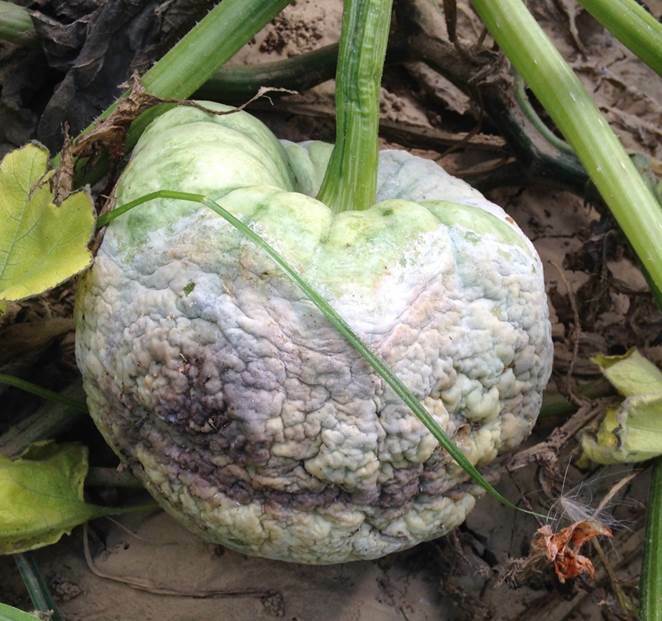 Scouts noted plectosporium blight, as confirmed by the vegetable pathology lab at OARDC, on several plantings of pumpkins in several different fields across the county. Bacterial wilt is being found both cucumbers as well as some fall squash and pumpkins. 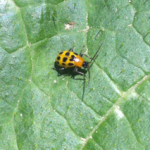 Cucumber beetles, the vector of the disease were noted at above threshold levels in younger cucumber, squash, zucchini, and pumpkin plantings and growers were being advised to treat to prevent bacterial wilt. 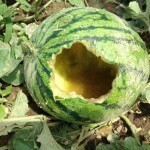 Fusarium wilt is being found in some melons. 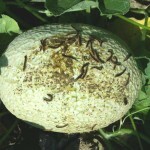 Although not common, millipedes have been doing damage to some melons, primarily cantaloupe. Scouts also noted the presence of squash bug eggs and nymphs. 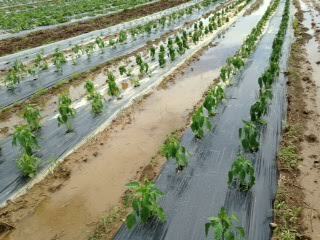 Many pepper plantings are at the harvest stage. 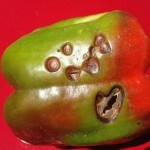 In some plantings, bacterial spot is present and bacterial soft rot has been observed. 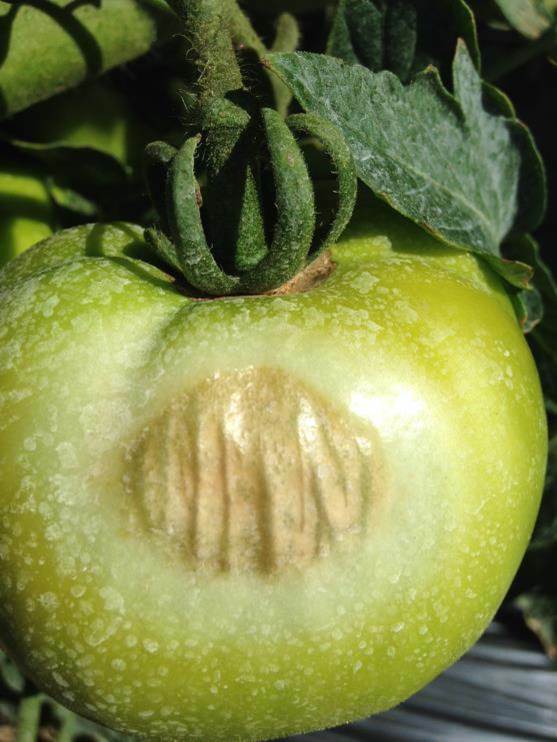 Sunscald and blossom end rot were noted again on scout reports this week and some of the sun-scalded fruit have now developed secondary infections of botrytis gray mold. Grasshoppers, European corn borers, potato leaf hoppers and aphids were all found at low levels in some fields, along with damage from stinkbugs. Eggplant overall is doing well but there are plants with verticillium wilt and anthracnose. 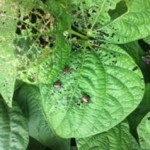 Colorado potato beetles and flea beetles were noted at above threshold levels in some field this week. Japanese beetles are present in low numbers. Sweet corn, due to staggered plantings, ranges from V-4 to harvest. Corn earworm moth trap captures ranged from 0 to 6 at 4 locations this week. This level still indicates a 5 day spray schedule for corn at green silk. European corn borer moth captures ranged from 0 to 6 between 4 trap locations the week of August 3-7. Feeding by, European corn borer larvae, Japanese beetles and fall armyworm larvae was noted by scouts this week. The heaviest feeding damage is being done by deer and raccoons. 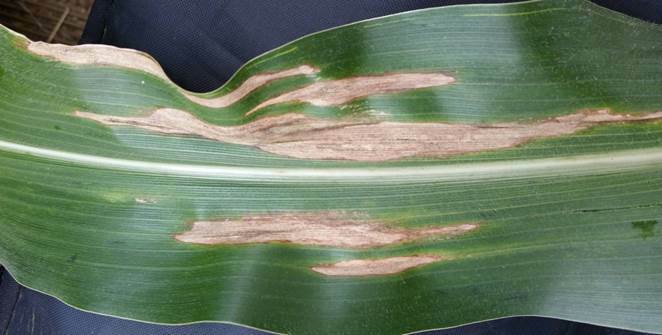 Scouts continued to find Northern corn leaf blight and corn rust this week. Potatoes overall look good and some are being harvested. Colorado potato beetle is at threshold levels in some plantings and under control in others. Low numbers of potato leaf hoppers and flea beetle were noted. Early blight and septoria leaf spot are showing up in some plantings. The occasional plant with blackleg is also being noted by scouts. A lot of corn is in the R-1 to R-3 stage of development. Brown silks signal an end to scouting. There was 1western bean cutworm moth captured between 2 trap locations this past week. Deer and bird damage is also being noted. 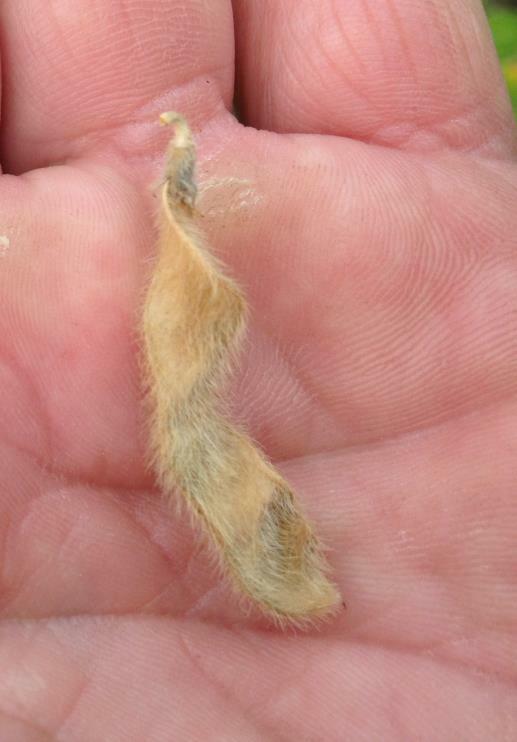 Scouts noted soybeans at the R2 to R5 stage of development this week. 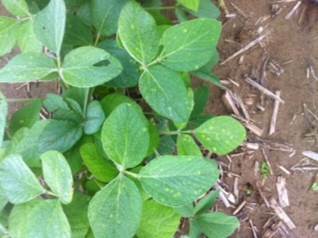 Scouts are noting brown spot on the lower leaves of most soybean fields as well as Downy Mildew. (See photo below) White mold has been found, but typically just a few plants affected in scattered pockets. Sudden death syndrome (SDS) was noted on some scout reports this week, but at very low levels, just a few scattered plants in a field. 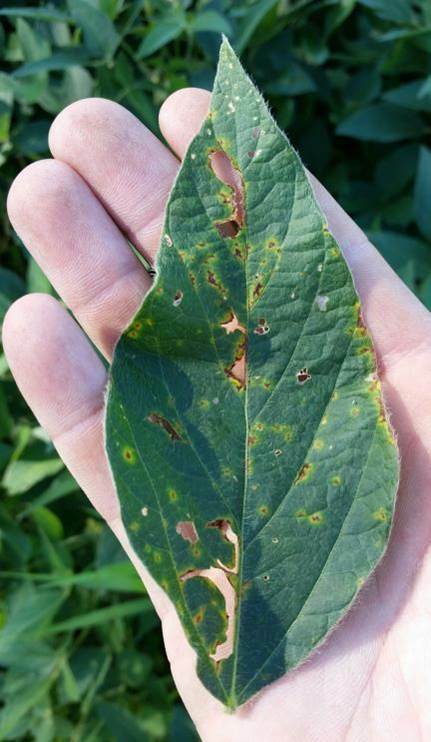 (See photo below) Leaf defoliators including bean leaf beetle, Japanese beetles, grasshoppers and slugs have all been noted on scouting reports. In some fields the combination of defoliators has caused between 10-20% plant defoliation. Scouts are sweeping fields for stink bugs as they reach the R3 stage of development. Stink bugs were found at very low levels once again the week of August 3-7. Alfalfa is being monitored for potato leaf hoppers. Populations are still low at this time. Many alfalfa fields have been cut for 3rd harvest and are regrowing. Peaches are developing and some harvest is on-going. Oriental fruit moth trap captures remained high again this week in a couple of orchards, about the 5th week in a row that captures have been high. Growers are being encouraged to stay on a spray schedule to prevent damage from oriental fruit moth. Both the peach tree borer and lesser peach tree borer moth showed up again in trap captures in a couple of orchards the week of July 27-31. Growers have been advised to do some preventative treatment against borer damage. Growers are encouraged to maintain fungicide sprays to prevent brown rot and scab and are doing a good job with this because scouts are not noting any disease in orchards that are scouted. Spotted wing drosophila (SWD) were caught in traps at 6 different locations during the week of July 27-31. Trap numbers ranged from 1 to 22. Commercial small fruit growers should be spraying ripe fruit and fruit that is beginning to ripen to protect against SWD infestation. Rotate between chemical classes of approved insecticides. Other than SWD, powdery mildew is showing up in grapes and growers need to be on a fungicide program to prevent damage from this disease. (See photo below) Some very light levels of grape black rot were also noted by scouts this week. Fall red raspberries are ripening, blackberry harvest is underway and later maturing variety blueberries are being harvested. Lots of sunshine combined with hot temperatures this week. There were a few comments by scouts on their grower reports that plants needed water or were showing symptoms of moisture stress. The most serious disease problems in both field and high tunnel grown tomatoes remain septoria leaf spot and early blight. Some early plantings have been finished off by the advances of these diseases. 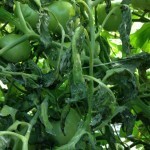 This week late blight was found and confirmed in a commercial tomato planting in Wayne County. 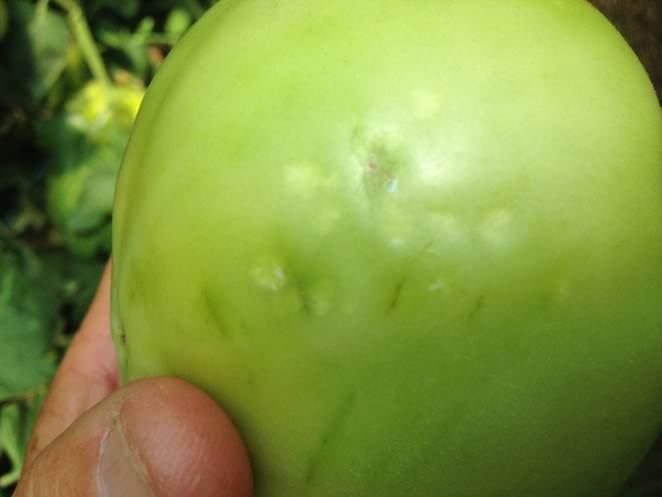 Bacterial spot and canker can be found in field tomatoes and growers are being advised to not work with the plants when they are wet, practice good sanitation between infected and non-infected plants and maintain a copper spray program to suppress the disease. In high tunnel production scouts are finding fusarium crown rot, Fusarium wilt, leaf mold, botrytis gray mold, timber rot and powdery mildew. 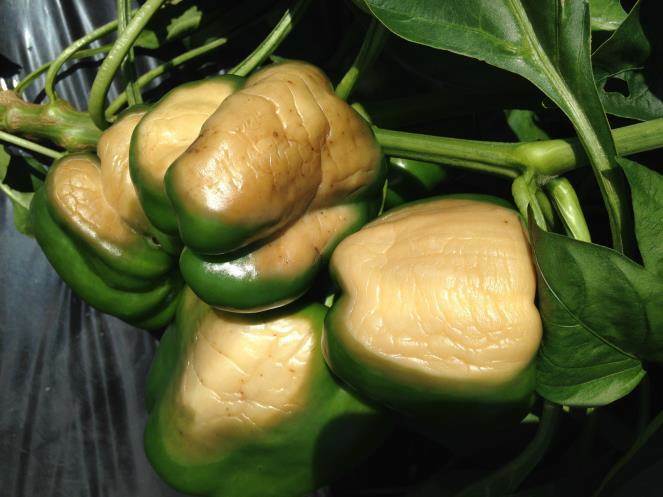 Non-disease, environmental disorders that scouts are finding in both field and high tunnel production include yellow shoulder, catfacing and zippering. 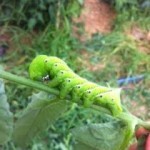 Stink bug damage is being found on tomatoes and hornworms have been found in both high tunnel and field grown tomatoes. Scouts noted some moderate to high aphid numbers in a couple of tomato high tunnels this week. Onions are being harvested and dried down for storage and garlic harvest is also underway. Cole crops overall look good. Some of the new plantings for a planned fall harvest had imported cabbage worm numbers above treatment threshold and growers were advised to treat. Flea beetles were also noted on some of the new plantings, but not at economic treatment level. Established plantings are at the almost ready to harvest to harvest underway stage. In vine crops, many plantings of summer squash and zucchini are being harvested regularly, fall squash and pumpkins are in bloom to some approaching harvest, cantaloupes are being harvested, watermelons range from fruit set to harvest, and cucumbers range from new plantings to harvest. Downy mildew was found in more cucumber fields this past week. Scouts also found more possible downy mildew in cantaloupe and sent a sample in to the vegetable pathology lab at OARDC for confirmation. Growers are being advised to use a fungicide spray program on a 5-7 day schedule to protect against downy mildew. Cucumbers are most vulnerable followed by cantaloupe and then squash, pumpkins and watermelon. Angular leaf spot, a bacterial disease has been found across all vine crops and in many fields. Anthracnose and alternaria leaf spot have also been found and growers need to be on a good fungicide spray program. Phytophthora blight on squash fruit was found in one field. Many pepper plantings are at the harvest stage. In some plantings, bacterial spot is present and bacterial soft rot has been observed. Scouts were finding a number of fruit with sunscald this past week as well as some blossom end rot. (See photo below) Scouts also noted mosaic virus in some plants this week. Grasshoppers and European corn borers were all found at low levels in some fields, along with damage from stinkbugs. Eggplant overall is doing well but there are plants with verticillium wilt and anthracnose. Colorado potato beetles and flea beetles were noted at above threshold levels in some field this week. Japanese beetles are present in low numbers. Green beans vary from newly emerging to harvest. Defoliation generally below threshold damage levels by grasshoppers, and Japanese beetles have been noted, although in some isolated areas of some plantings defoliation by Japanese beetles is heavy. A lot of corn is in the R-1 to R-3 stage of development. Brown silks are beginning to show up in some fields, signaling an end to scouting. Northern corn leaf blight is being seen in some fields but at low levels, so far below what would be considered for a fungicide treatment. Japanese beetles and grasshoppers are all being noted at low levels in some fields. There was 1 western bean cutworm moth captured between 2 trap locations this past week. Also finding western corn root worm adults in some organic field corn silks. (See photo below) Deer and bird damage is also being noted. In fields with good drainage soybeans look good and soybeans are at pod development, R3-4. 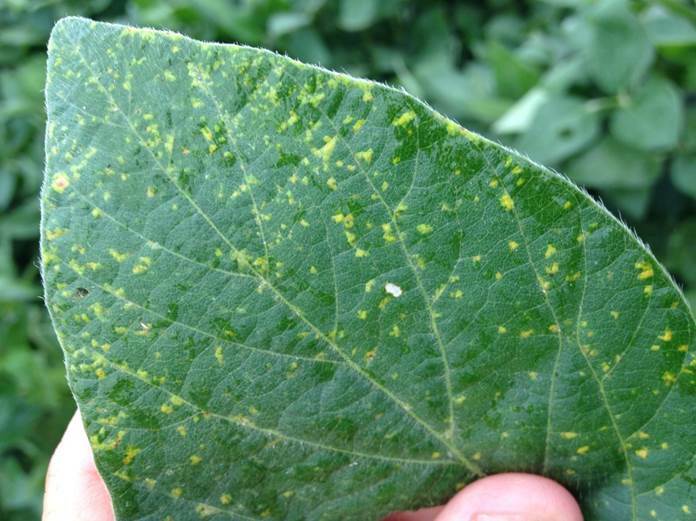 Scouts are noting brown spot on the lower leaves of most soybean fields and seeing a few areas of Bacterial blight. 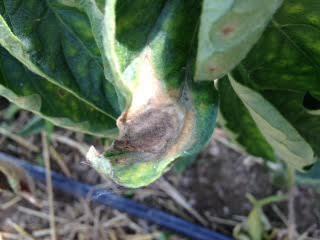 (See photo below) White mold is starting to show up in pockets but generally low levels. Leaf defoliators including bean leaf beetle, Japanese beetles, grasshoppers and slugs have all been noted on scouting reports. Scouts are sweeping fields for stink bugs as they reach the R3 stage of development. Stink bugs were found at very low levels once again the week of July 27-31. Alfalfa is being monitored for potato leaf hoppers. Populations are still low at this time. Alfalfa height ranges from 5 to 27 inches. A variety of insects are being noted in sweep net samples including aphids, grasshoppers, Japanese beetles, alfalfa plant bugs and clover worms. All are at levels below an economic treatment threshold. The bigger issue is some of the compaction damage that was done to some fields during a wet second cut harvest. Some plants have been lost and there are areas that are slow to recover. Apples are progressing in fruit development and overall the crop looks very good. Codling moth numbers increased in several orchards this week, which will trigger a biofix date to determine treatment for second generation codling moth. 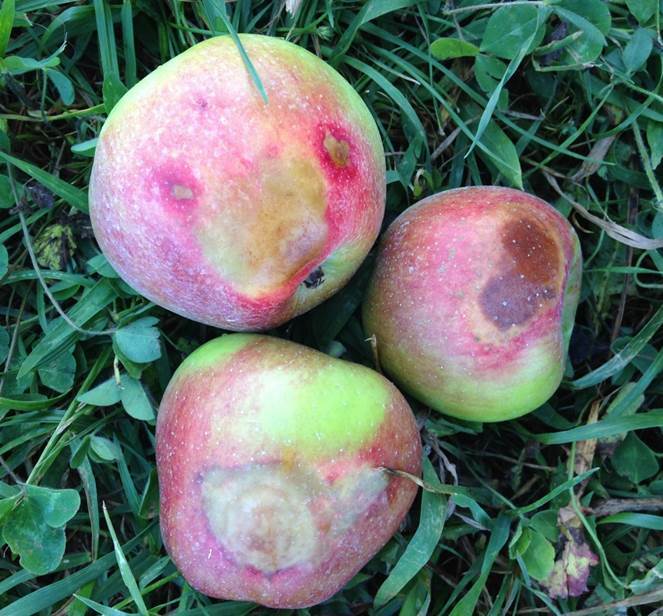 Sooty blotch, one of our summer fungal diseases was noted on some apples this week. Growers need to stay on a fungicide program to prevent both sooty blotch and fly speck disease development during the summer. All apple maggot traps remained negative the week of July 20-24. Other insects noted at below threshold levels in orchards included green apple aphids, and Japanese beetles. European red mites and 2-spotted spider mites were found at threshold levels in a couple of orchard. 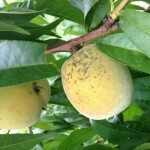 Peaches are developing with minimal pest issues being noted. Oriental fruit moth trap captures remained high this week about the 4th week in a row that captures were high. Both the peach tree borer and lesser peach tree borer moth showed up in trap captures in a couple of orchards the week of July 20-24. Growers will be advised to do some preventative treatment against borer damage. Growers are encouraged to maintain fungicide sprays to prevent brown rot and scab. Spotted wing drosophila (SWD) were caught in traps at 3 different locations during the week of July 20-24. Some traps had multiple captures as SWD populations begin to build. Commercial small fruit growers should be spraying ripe fruit and fruit that is beginning to ripen to protect against SWD infestation. Rotate between chemical classes of approved insecticides. Other than SWD, powdery mildew is showing up in grapes and growers need to be on a fungicide program to prevent damage from this disease. Black raspberry harvest has finished and red raspberries are being harvested, while blackberry harvest is beginning. Early variety blueberries are finished, while mid and late season berries are being harvested. Japanese beetles are present in low levels and birds are working on some of the berries. The sun came out and there were multiple days without rain this week, which is helpful in vegetable growth, fruit development and fruit ripening. Disease pressure remains high. Garlic and onion harvest is underway and scouts report that overall clove and bulb size is good. Cole crops overall look good. 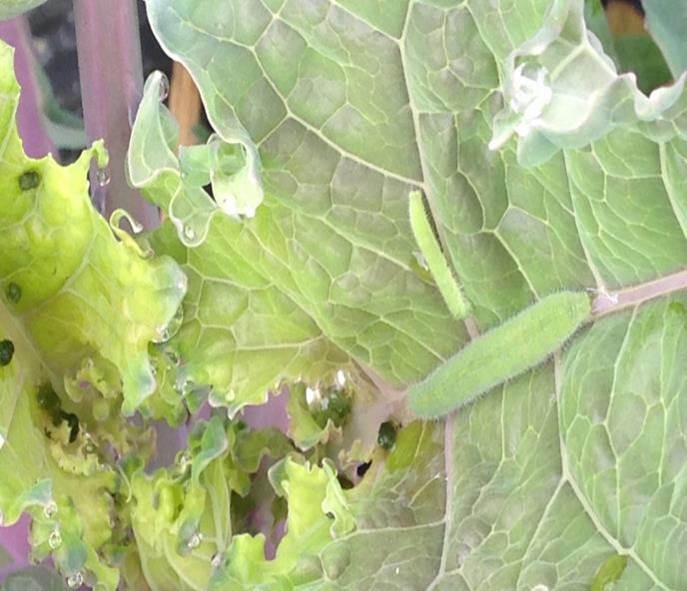 Some of the new plantings for a planned fall harvest had imported cabbage worm numbers above treatment threshold and growers were advised to treat. Flea beetles were also noted on some of the new plantings, but not at economic treatment level. Established plantings are at the almost ready to harvest to harvest underway stage. Some bacterial soft rot was noted in some plants of one planting by scouts. 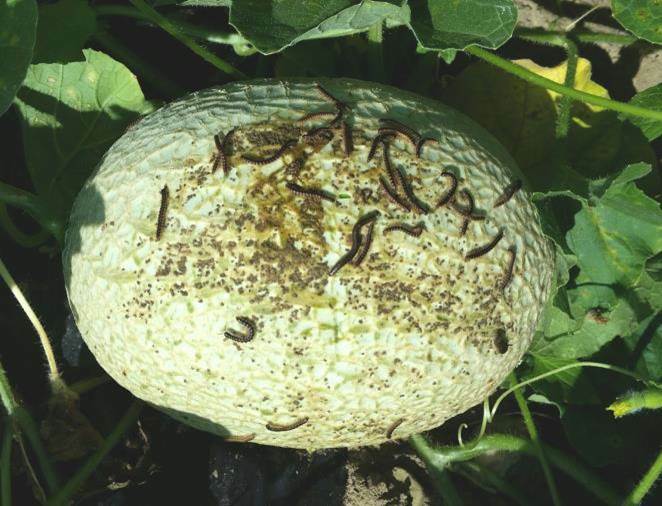 Imported cabbage worm larvae were found and in some fields were at economic treatment threshold. In vine crops, many plantings of summer squash and zucchini are being harvested regularly, fall squash and pumpkins are in bloom to some approaching harvest, cantaloupes are being harvested, watermelons range from fruit set to nearly harvest ready, and cucumbers range from new plantings to harvest. Downy mildew was found in more cucumber fields this past week. Scouts also found possible downy mildew in cantaloupe and sent a sample in to the vegetable pathology lab at OARDC for confirmation. Growers are being advised to use a fungicide spray program on a 5-7 day schedule to protect against downy mildew. Cucumbers are most vulnerable followed by cantaloupe and then squash, pumpkins and watermelon. 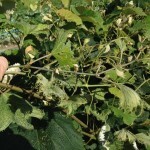 Probably the quickest developing disease across vine crops at this time is powdery mildew. Scouts noted in increase in powdery mildew across plantings of summer squash, zucchini, pumpkins, fall squash and melons. Bacterial wilt is being found in some cucumbers. Cucumber beetles, the vector of the disease were noted at above threshold levels in younger cucumber, squash, zucchini, and pumpkin plantings and growers were being advised to treat to prevent bacterial wilt. Many pepper plantings are at the harvest stage. In some plantings, bacterial spot is present. Scouts also noted some mosaic virus and possible cercospora leaf spot in some plants this week. Japanese beetles, zebra caterpillars, grasshoppers and European corn borers were all found at low levels in some fields. 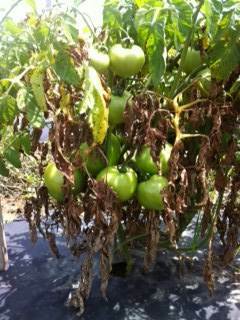 Eggplant is doing well but there are plants with verticillium wilt and anthracnose. Colorado potato beetles and flea beetles were noted at above threshold levels in some field this week. Japanese beetles and stink bugs are present in low numbers. Green beans vary from newly emerging to harvest. Defoliation generally below threshold damage levels by grasshoppers, and Japanese beetles have been noted, although in some isoloated areas of some plantings defoliation by Japanese beetles is heavy. Other insect pests noted at below threshold levels include bean leaf beetles, tarnished plant bugs and stinkbugs. Sweet corn, due to staggered plantings, ranges from newly emerging to harvest. Only 2 corn earworm moth was caught between traps at 4 locations this week. European corn borer moth captures ranged from 0 to 2 between 4 trap locations the week of July 20-24. Corn earworm moth captures were 0 in 4 trap locations. 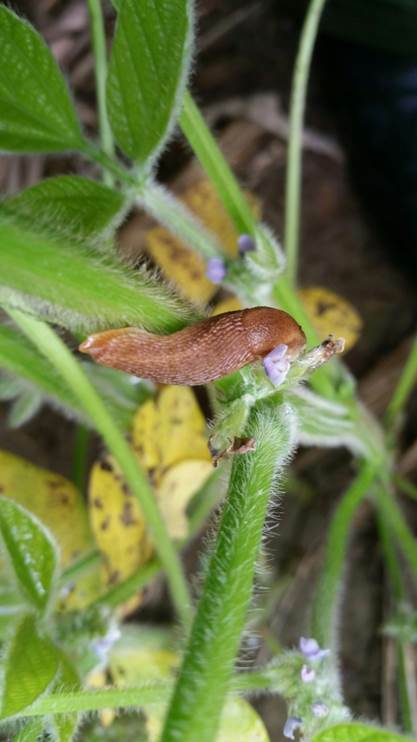 Feeding by snails, slugs, European corn borer larvae, Japanese beetles and fall armyworm was noted by scouts this week. 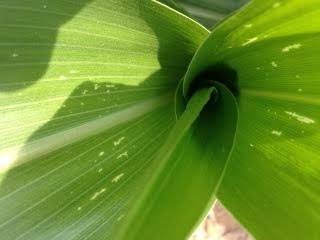 Japanese beetles are feeding on corn silks. 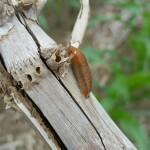 In addition to Northern corn leaf blight, corn rust was found by scouts this week. Corn ranges in development from v-10 to R3. 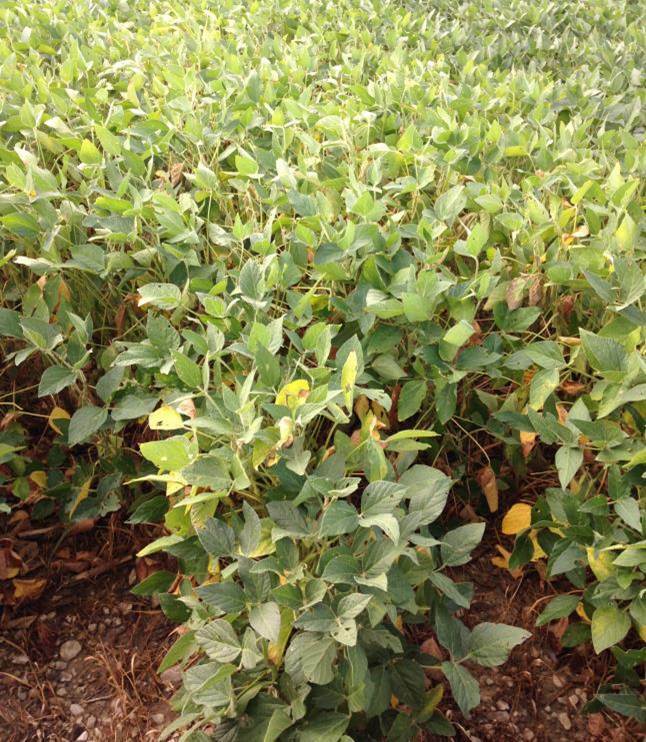 In some fields lower leaves are turning yellow due to nitrogen shortage as the plant mobilizes nitrogen from older leaves to use for younger leaf growth. Wet soils have caused nitrogen loss through both denitrification and leaching. Grey leaf spot in some fields and some varieties is at levels that may warrant a fungicide spray at stage V-T. Northern corn leaf blight is also being seen in some fields but at low levels, so far below what would be considered for a fungicide treatment. Japanese beetles and grasshoppers are all being noted at low levels in some fields. There were 6 western bean cutworm moths captured between 2 trap locations this past week. Deer damage is also being noted. Alfalfa is being monitored for potato leaf hoppers. Populations are still low at this time. Alfalfa height ranges from 5 to 17 inches. A variety of insects are being noted in sweep net samples including aphids, grasshoppers, Japanese beetles, alfalfa plant bugs and clover worms. All are at levels below an economic treatment threshold. Apples are progressing in fruit development and overall the crop looks very good. Codling moth numbers started to tick upward in a few traps this week. 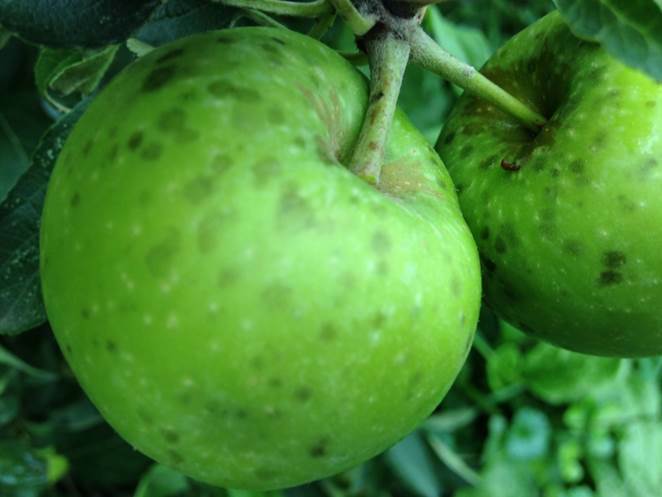 Sooty blotch, one of our summer fungal diseases was noted on some apples this week. (see photo below) Growers need to stay on a fungicide program to prevent both sooty blotch and fly speck disease development during the summer. All apple maggot traps remained negative the week of July 13-17, though one apple maggot fly was noted by a scout on an apple leaf. Other insects noted at below threshold levels in orchards included green apple aphids, wooly apple aphids, leafminers and Japanese beetles. 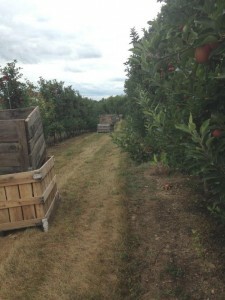 European red mites and 2-spotted spider mites were found at threshold levels in one orchard. There were positives once again this weekin the spotted wing drosophila (SWD) traps. Commercial small fruit growers should be spraying ripe fruit and fruit that is beginning to ripen to protect against SWD infestation. Rotate between chemical classes of approved insecticides. Other than SWD, powdery mildew is showing up in grapes and growers need to be on a fungicide program to prevent damage from this disease. Black raspberry harvest is wrapping up and red raspberries are being harvested. Blueberries are ripe and picking has begun. Some low levels of phomophsis blight have been seen. Japanese beetles are present in low levels and birds are working on some of the berries. The continued wet weather is causing all sorts of issues. Diseases, both fungal and bacterial are present at varying levels in fields, and wet, saturated soils are causing nitrogen loss, some root damage, and yellow plants in some areas. 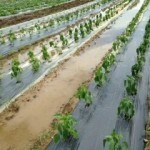 Despite this, growers are harvesting and plants are producing. Use of fungicide spray programs, where appropriate, is a key component in production at this point. 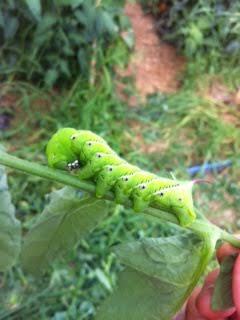 The tomato hornworm showed up in scouting reports in both high tunnel and field grown tomatoes. (See Photo below) Despite their size they are difficult to actually locate because they blend in to the plant so well. Damage symptoms and frass are the first clues noted. Other insect pests noted in high tunnel production, all below threshold levels, are: aphids, white flies and stink bugs. 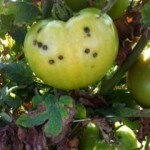 The most serious disease problems in both field and high tunnel grown tomatoes are septoria leaf spot and early blight. In warm, wet conditions, septoria can rapidly defoliate a plant if not managed early with an effective and consistent fungicide spray program. 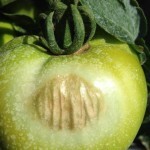 Bacterial spot is also showing up, mainly in field tomatoes and growers are being advised to not work with the plants when they are wet, practice good sanitation between infected and non-infected plants and maintain a copper spray program to suppress the disease. In high tunnel production scouts are also finding fusarium crown rot, leaf mold, botrytis gray mold, timber rot and yellow shoulder. Garlic is maturing tops are beginning to dry down. In onions, thrip populations have remained low. Onion harvest is also beginning with generally good bulb size being reported. Cole crops overall look good. 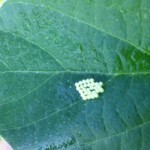 The new plantings for a planned fall harvest had both slug damage and imported cabbage worm eggs noted. Established plantings are at the almost ready to harvest to harvest underway stage. Some bacterial soft rot was noted in some plants of one planting by scouts. Imported cabbage worm larvae were found and in some fields were at economic treatment threshold. In vine crops, many plantings of summer squash and zucchini are at the point of harvest, fall squash and pumpkins are in bloom, melons are at fruit set, and cucumbers range from new plantings to harvest. Downy mildew was found in more cucumber fields this past week. Bacterial wilt is also being found in some cucumbers. Growers are being advised to use a fungicide spray program on a 5-7 day schedule to protect against downy mildew. Cucumbers are most vulnerable followed by cantaloupe and then squash, pumpkins and watermelon. Powdery mildew was noted by scouts in summer squash, fall squash, pumpkins and cucumbers this week. 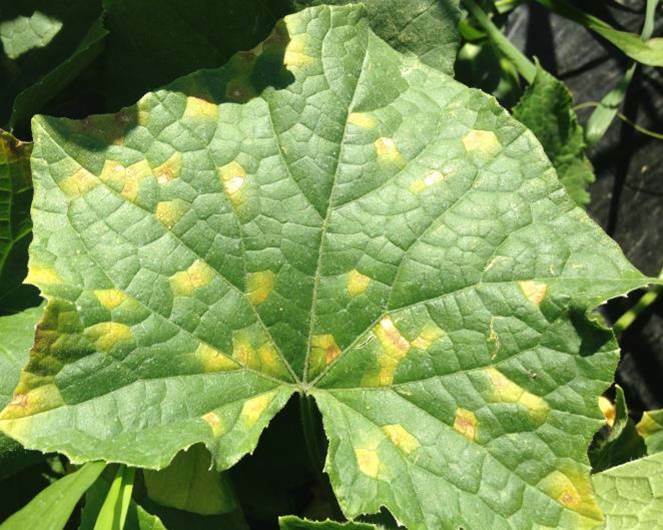 Angular leaf spot, a bacterial disease has been found across all vine crops and in many fields. Anthracnose and alternaria leaf spot have also been found and growers need to be on a good fungicide spray program. 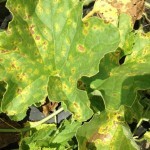 Bacterial wilt, a disease vectored by cucumber beetles was noted by scouts in both melons and cucumbers this week. Cucumber beetles ranged from low numbers to above treatment threshold levels. Deer damage was noted by scouts in a number of fields. Peppers are developing fruit with some ready to harvest. In some plantings, bacterial spot is present. Scouts also noted some Fusarium crown rot and mosaic virus in some plants this week. (See photo below). Japanese beetles, zebra caterpillars, stinkbugs and aphids were all found at low levels in some fields. Eggplant is doing well but there are plants with verticillium wilt and anthracnose. 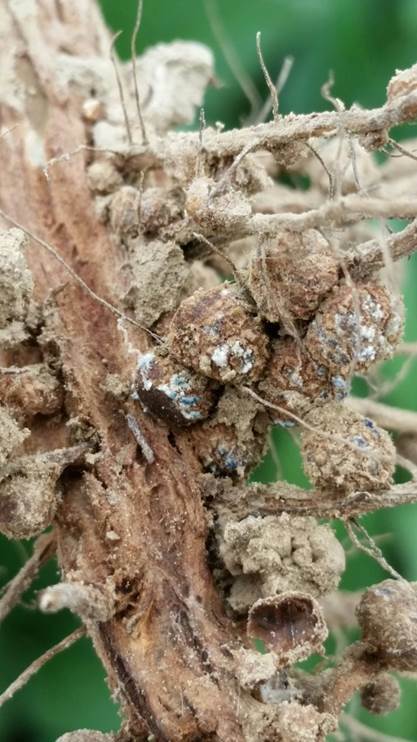 Colorado potato beetles were noted at above threshold levels in some field this week. Japanese beetles are present in low numbers. Green beans vary from newly emerging to harvest. Overall quality is good, no disease has been noted. In some plantings there are Japanese beetles that have caused defoliation above the 30% threshold level. Other insect pests noted at below threshold levels include slugs, bean leaf beetles and grasshoppers. Sweet corn, due to staggered plantings, ranges from newly emerging to harvest. Only 2 corn earworm moth was caught between traps at 4 locations this week. European corn borer moth captures ranged from 0 to 2 between 4 trap locations. Feeding by snails, slugs, European corn borer larvae, Japanese beetles, grasshoppers and fall armyworm was noted by scouts this week. In one field the level of Northern corn leaf blight in pre-tassel corn was above threshold level and a fungicide spray was recommended. Potatoes overall look good. Some plantings are ready for harvest. Colorado potato beetle is at threshold levels in some plantings and under control in others. Low numbers of potato leaf hoppers and flea beetle were noted. 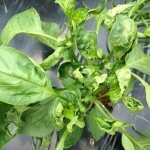 Some light levels of early blight were found in one planting. Corn ranges in development from v-8 to R2 (blister). In some fields lower leaves are turning yellow due to nitrogen shortage as the plant mobilizes nitrogen from older leaves to use for younger leaf growth. Wet soils have caused nitrogen loss through both denitrification and leaching. Grey leaf spot in some fields and some varieties is at levels that may warrant a fungicide spray at stage V-T. Northern corn leaf blight is also being seen in some fields but at low levels. (See photo below) European corn borer, Japanese beetles and grasshoppers are all being noted at low levels in some fields. Deer damage is also being noted. 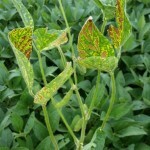 In low areas and poorly drained areas water is standing in some fields and soybean growth and development is suffering. Root rot has been noted. In other fields soybean growth looks good and soybeans are at pod development, R3-4. 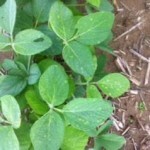 Scouts are noting brown spot on the lower leaves of most soybean fields. 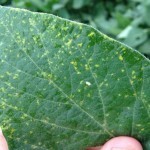 Bacterial leaf blight has been found in some fields. White mold is just starting to show up in pockets but generally low levels. 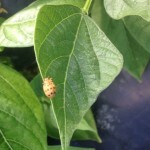 Leaf defoliators including bean leaf beetle, Japanese beetles, grasshoppers, Bean leaf beetles and slugs have all been noted on scouting reports. (See photo below) No western bean cutworm moths have been captured in traps to this point. Alfalfa is being monitored for potato leaf hoppers. Populations are still low at this time. Some yellowing of alfalfa plants is not due to leafhoppers, but rather wet soils. Alfalfa roots are struggling in low areas and wet soils. Plant collapse is being noted in some wheel track areas where harvesting took place on wet soils. Apples are progressing in fruit development and overall the crop looks very good. Codling moth numbers in traps remained low this week. Based on growing degree days (GDD) accumulated, a second generation moth flight should be noted soon. All apple maggot traps remained negative the week of July 6-10. 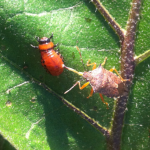 Other insects noted at below threshold levels in orchards included green apple aphids, wooly apple aphids, European red mites, leafminers and Japanese beetles. Growers have done a good job with their fungicide spray programs and disease levels are low in orchards scouted by this program. Peaches are also developing with minimal pest issues being noted. Oriental fruit moth trap captures were high this week. This will prompt a biofix date being set, and an advisory to spray for OFM early in the week of July 13-17. Turning to small fruit, the big news is that there were positives in the spotted wing drosophila (SWD) traps this past week. Samples collected July 8 from traps placed in raspberries in the West Salem area and samples collected July 9 from traps in raspberries in the Wooster area had SWD flies. Numbers are still low, only 3 total SWD flies were found, but the threshold to begin an insecticide spray program is 1 SWD found in a trap. Growers are being advised to start a spray program on ripening and ripe small fruits. Other than SWD, powdery mildew is showing up in grapes and growers need to be on a fungicide program to prevent damage from this disease. Raspberry harvest is progressing and no other pest issues were noted. Blueberries are ripe and picking has begun. Some low levels of phomophsis blight have been seen. Japanese beetles are present in low levels and birds are working on some of the berries. Wet weather is causing all sorts of issues. Diseases, both fungal and bacterial are present at varying levels in fields, and wet, saturated soils are causing nitrogen loss, some root damage, and yellow plants in some areas. Despite this, growers are harvesting and plants are producing. Use of fungicide spray programs, where appropriate, is a key component in production at this point. Garlic is maturing tops are beginning to dry down. In onions, thrip populations have remained low. 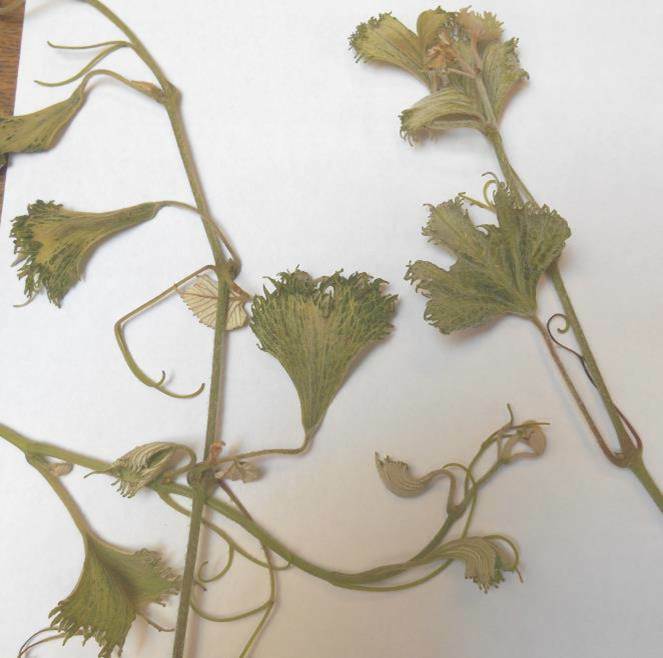 In some plantings, botrytis leaf blight and purple blotch are causing some yield reductions. Cole crops overall look good. Some new plantings for a planned fall harvest were going in this week. Established plantings are at the almost ready to harvest to harvest underway stage. Some bacterial soft rot was noted in some plants of one planting by scouts. Imported cabbage worm larvae were found and in some fields were at economic treatment threshold. Zebra caterpillars are also being found in cole crops, resulting in some minimal defoliation. In vine crops, many plantings of summer squash and zucchini are at the point of harvest, fall squash and pumpkins are in bloom, melons are at fruit set, and cucumbers range from new plantings to harvest. Downy mildew has been found in Wayne County so growers are being advised to use a fungicide spray program on a 5-7 day schedule to protect against downy mildew. Cucumbers are most vulnerable followed by cantaloupe and then squash, pumpkins and watermelon. 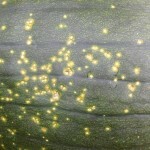 Powdery mildew also was noted by scouts in summer squash this week. 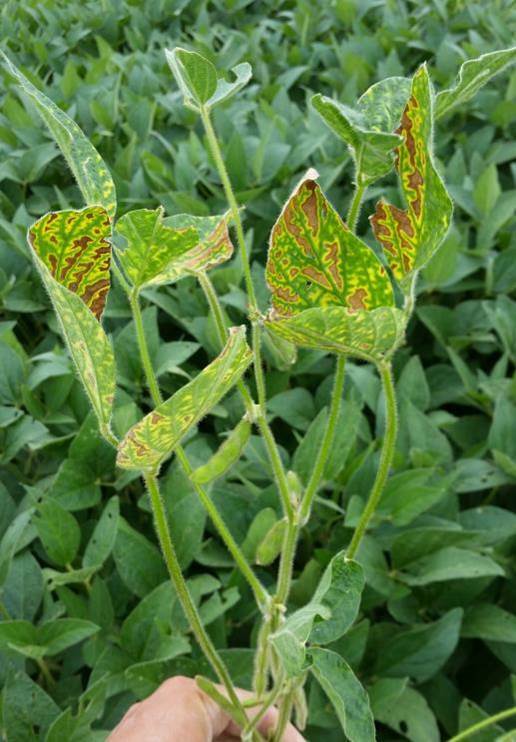 Angular leaf spot, a bacterial disease has been found across all vine crops and in many fields. Anthracnose and alternaria leaf spot have also been found and growers need to be on a good fungicide spray program. 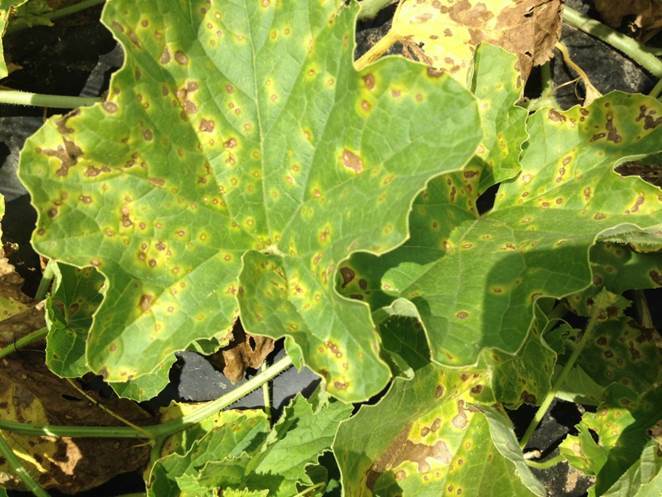 (See photo below) Bacterial wilt, a disease vectored by cucumber beetles was noted by scouts in both melons and cucumbers this week. Cucumber beetles ranged from low numbers to above treatment threshold levels. 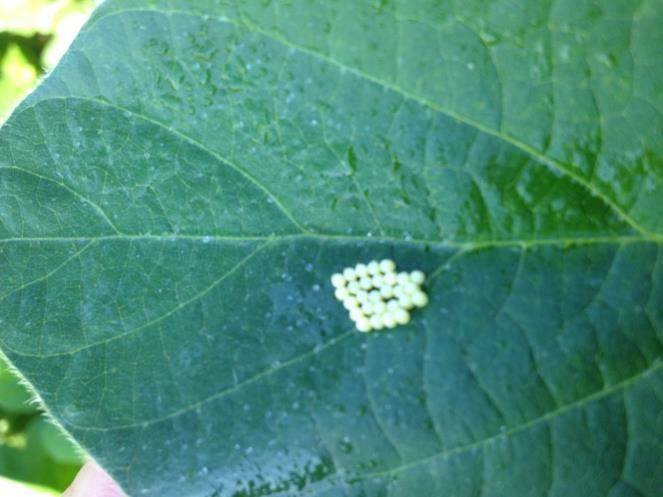 Scouts found squash bug eggs on fall squash and pumpkin leaves this week so growers need to be watching for this insect pest. Peppers are developing fruit with some ready to harvest. In some plantings, bacterial spot is present. Scouts also noted blossom end rot, Japanese beetles and zebra caterpillars at low levels in some fields. (See Photo Below) Eggplant is doing well but there are plants with verticillium wilt and anthracnose. 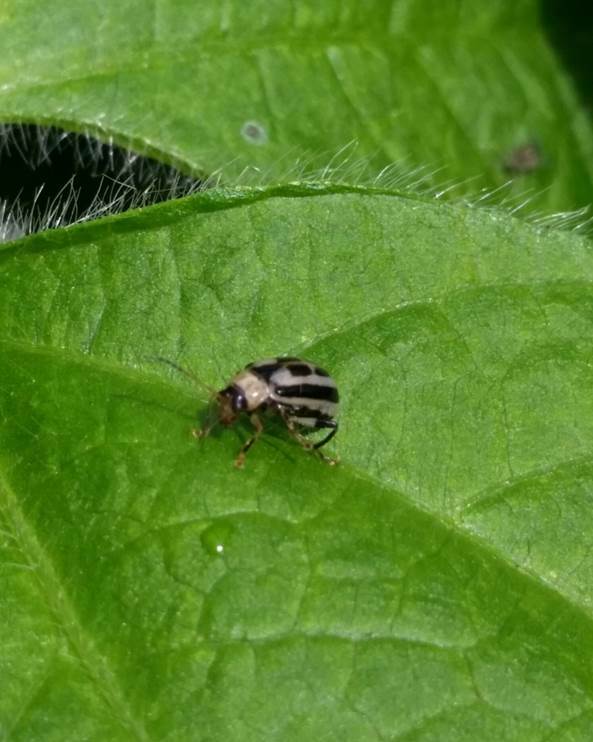 Colorado potato beetles were noted at low numbers this week. Green beans vary from newly emerging to harvest. Overall quality is good. 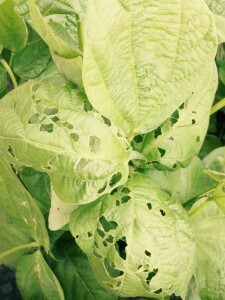 In some plantings there are Japanese beetles and low levels of potato leaf hoppers. Sweet corn, due to staggered plantings, ranges from v-4 to harvest. Only 1 corn earworm moth was caught between traps at 4 locations this week. European corn borer moth captures ranged from 0 to 8 between 4 trap locations. 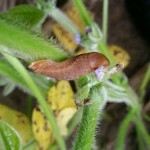 Feeding by snails, slugs, European corn borer larvae, Japanese beetles and grasshoppers was noted by scouts this week. Potatoes overall look good. Colorado potato beetle is at threshold levels in some plantings and under control in others. Low numbers of potato leaf hoppers were noted. 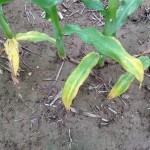 Some light levels of early blight were found in one planting. Corn ranges in development from v-6 to R1 silking. In some fields lower leaves are turning yellow due to nitrogen shortage as the plant mobilizes nitrogen from older leaves to use for younger leaf growth. Wet soils have caused nitrogen loss through both denitrification and leaching. Grey leaf spot in some fields and some varieties is at levels that may warrant a fungicide spray at stage V-T. Northern corn leaf blight is also being seen in some fields but at low levels. European corn borer, Japanese beetles and grasshoppers are all being noted at low levels in some fields. Overall both apples and peaches are still looking good although scouts did note a large increase in both European red mites and 2-spotted spider mites on some varieties of apples the last couple of weeks. Populations were large enough that miticide treatments were recommended. Some traps for oriental fruit moth(OFM) had higher moth captures, indicating that we probably have second generation OFM so a biofix date will be set and growing degree days will be tracked to determine when insecticide applications should be made to peach trees. In the small fruit area strawberry harvest has ended, and growers will need to start thinking about renovation in fields that will be kept for next year production. Some red raspberries and black raspberries are beginning harvest, and some blueberry varieties also have ripe berries. Birds are already working on some of the ripe blueberries. Grapes are developing fruit which are approximately pea-sized to a little larger at this point. Japanese beetles are showing up in grapes but any damage is below threshold at this point. Scouts are monitoring and trapping for spotted wing drosophila fruit flies and all trap counts are negative at this point. Recent rainfall events have caused ponding in some areas of fields and lots of areas of wet, saturated soils. 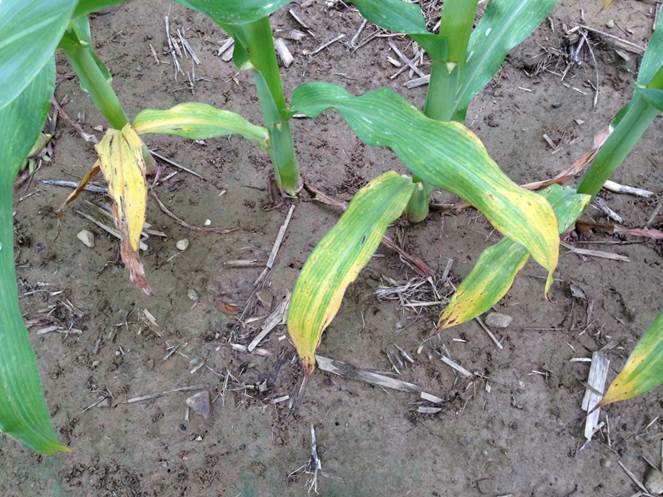 As a result scouts are seeing yellowing of plant leaves, damping off, and some dying plants. 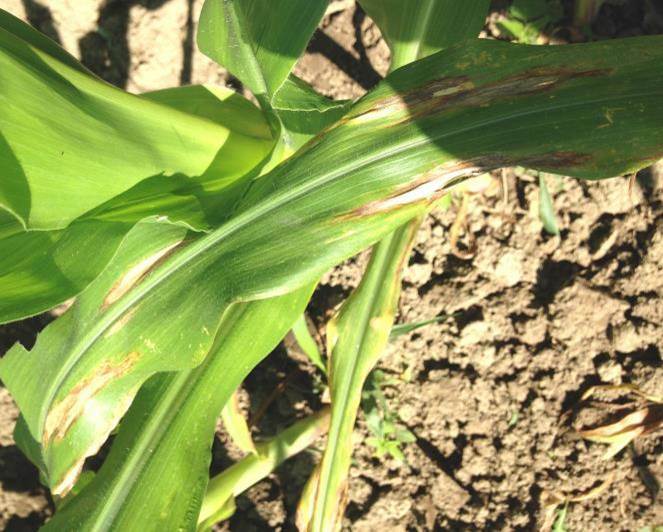 While diseases were very minimal in most vegetable fields through mid-June, the rains and higher temperature and humidity since then has kicked off some disease cycles and scouts are noting more incidences of disease during the scouting week beginning June 22. Sally Miller’s announcement of downy mildew being found in SE Michigan on June 22 triggered an advisory to begin a protectant fungicide spray program on cucumbers and melons. Field grown tomatoes are at flower and fruit set. Until the week of June 22 no diseases had been found by scouts in field tomatoes, however that has changed and scouts reported plants in some fields with symptoms of septoria leaf spot, early blight, and bacterial spot and possible bacterial canker. Onions and garlic are developing well in the majority of fields. Scouts have found yellow strip virus, a potyvirus, in garlic. A couple of onion fields have some purple blotch (alternaria), while thrips have remained below treatment threshold level, possibly due at least in part to all the rainfall events. Cole crops look good overall, although a few fields are at threshold level for imported cabbage worm larvae and need to be treated. Green snap beans are at a range of development stages as staggered planting continues. Some early plantings are just at harvest ready. Common pest problems include, bean leaf beetle leaf feeding, flea beetles, potato leaf hoppers and Japanese beetles. Currently all pests are below threshold levels. Eggplant and pepper plantings were doing well, but some saturated soils may change that status over the next couple of weeks in some fields. 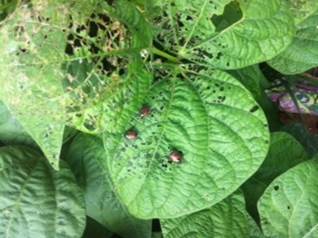 Scouts did note Colorado potato beetle feeding on some eggplant at threshold level. 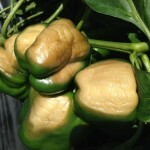 Some peppers have fruit with symptoms of blossom end rot and there is some leaf spot showing up on some plants as well. Sweet corn is another crop at various development stages due to staggered planting and growth stages range from V-2 to tassel and silking. Both corn earworm and European corn borer moths are being caught in pheromone traps. Corn earworm moth numbers are low, 2-3/trap while corn borer moth counts ranged from 0 to 15/trap. 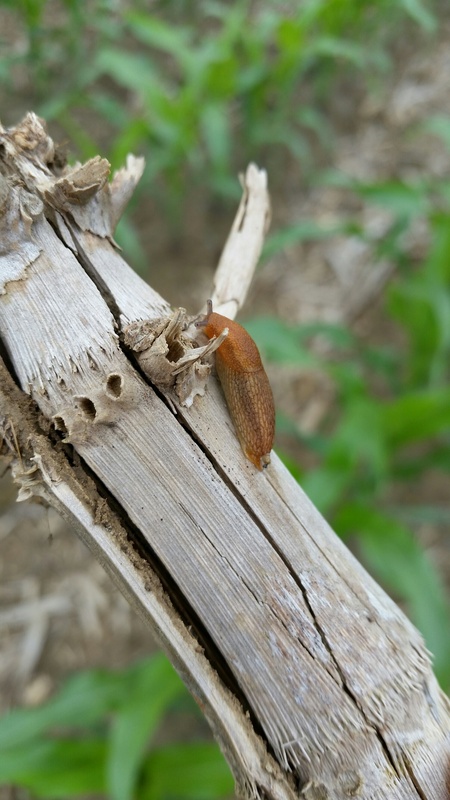 European corn borer larvae feeding damage and larvae are being found, and with some fields at tassel and silking stage, the threshold level of damage has been reached and growers have been advised to spray. Japanese beetles and corn rootworm beetles are also present, currently at low levels in some fields. As mentioned at the beginning of this report, cucumber and melon growers are being advised to start a protectant fungicide spray program against downy mildew. Other diseases that have shown up in vine crops include angular leaf spot, anthracnose and alternaria/target spot. Some water logged fields have plants dying back due to wet soils. Growers have treated for cucumber beetle pressure in squash, pumpkins, zucchini and melons and treatment has been effective as scouts have noted the presence of dead beetles. Other fields have reached threshold level and will need to be treated. 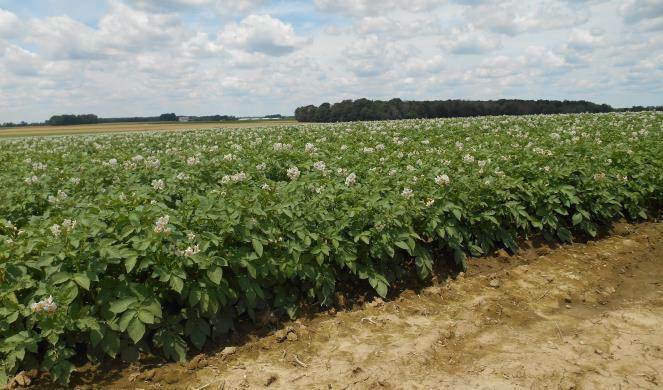 Many potatoes are in flower and tuber development. (See photo below) Colorado potato beetles is at or above threshold levels in some fields and in others control treatments have been successful in bring beetle numbers down. Potato leaf hopper numbers have remained low. Other insects noted at low levels in potato fields include flea beetles and tarnished plant bugs. In a few fields scouts have found some plants with black leg. 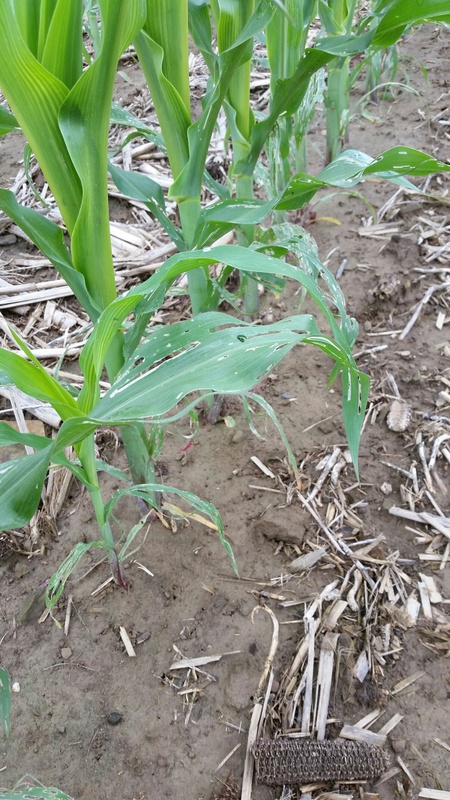 Scouts are noting low levels of corn borer larvae leaf feeding damage along with low levels of Japanese beetles, tarnished plant bugs and some slugs. 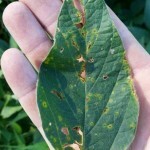 Disease-wise, grey leaf spot was noted at low levels in some fields. 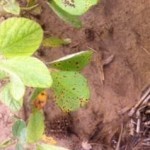 In soybeans wet soils are causing plants to yellow and in some areas where plants were submerged, there is plant death. Soybeans range from v-4 to R-l growth stage. Bean leaf beetle, grasshoppers and Japanese beetles are all doing some leaf feeding but all damage remains below treatment threshold levels. 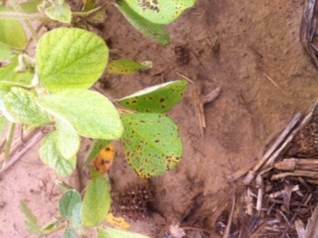 Scouts did find some brown spot and some possible bacterial leaf disease in soybeans this week. Damage to stands is also being caused by deer and groundhog feeding. Rain has hampered second cut harvest of alfalfa. Once that happens, scouts will be monitoring for potato leaf hoppers. Overall both apples and peaches are still looking good although scouts did note a large increase in both European red mite and 2-spotted spider mites on some varieties of apples. Populations were large enough that miticide treatments were recommended. In the small fruit area strawberry harvest is approaching an end, while some red raspberries will soon begin harvest, and some blueberry varieties also have ripe berries. Grapes are developing fruit which are approximately pea-sized at this point. Scouts are monitoring and trapping for spotted wing drosophila fruit flies and all trap counts are negative at this point. The biggest issue that scouts are running into is high tunnel management with tomatoes. Tomatoes are ripening and harvest is underway in some tunnels, but some growers need to work on opening up the tunnel to get more air movement and to reduce some of the high relative humidity that can be present. Scouts have noted leaf mold, early blight, sclerotina timber rot, blossom end rot and yellow shoulder in high tunnel tomatoes. 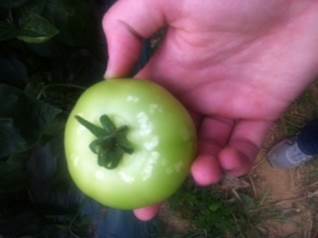 (See photo below) Field grown tomatoes are at flower and fruit set with no disease problems currently being reported. Onions and garlic are developing well in the majority of fields. This past week scouts did find yellow stripe virus, a potyvirus, in garlic. A couple of onion fields have some purple blotch (alternaria), while thrips have remained below treatment threshold level. Growers have treated for cucumber beetle pressure in squash, pumpkins, zucchini and melons and treatment has been effective as scouts have noted the presence of dead beetles. Other fields have reached threshold level and will need to be treated. Green snap beans are at a range of development stages as staggered planting continues. Some early plantings are just at harvest ready. Common pest problems include slugs, bean leaf beetle leaf feeding and flea beetles. Currently all pests are below threshold levels. 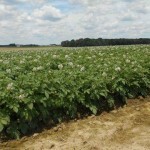 Many potatoes are in flower and tuber development. 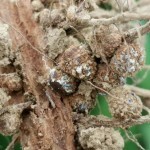 Colorado potato beetles is at or above threshold levels in some fields and in others control treatments have been successful in bring beetle numbers down. Soybeans: The big concern voiced from scouts was ponding and saturated soils. This is a particular concern in soybeans where in many of the fields the crop just seems to be standing still and is not advancing in growth stage. 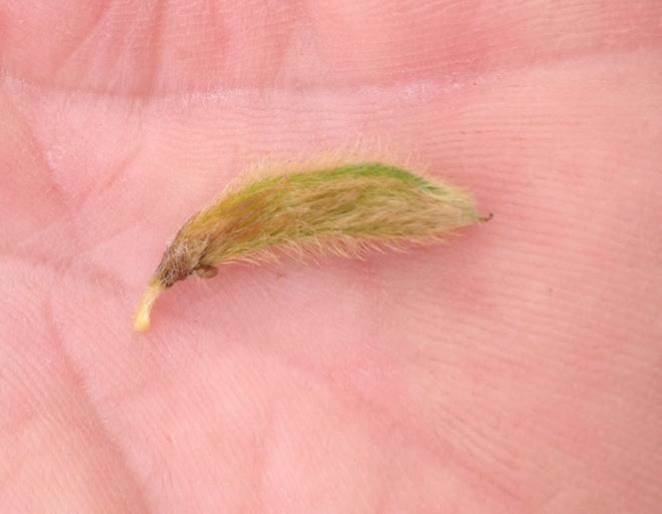 Some damping off has been observed in some portions of some soybean fields. Insect pests present include slugs, flea beetles, bean leaf beetle and Japanese beetles. None at threshold level. Alfalfa: Rains are delaying second harvest. Potato leaf hopper (PLH) counts increased this week, averaging between 1 and 9 PLH adults and nymphs per 10 sweep sample, but since alfalfa height is averaging between 15 to 30 inches, these numbers are still below threshold. Other insects noted by scouts include pea aphids, alfalfa plant bug, tarnished plant bug and Japanese beetles. None are at threshold levels.